Are you travelling to Australia? Not sure on what to see and do in Australia? Whether you are an overseas visitor or an Australian wanting to explore more of the country, here is plenty of inspiration to get that plan off the ground. This list has been created with a number of travel experts to become your resource for the ultimate Australian bucket list. 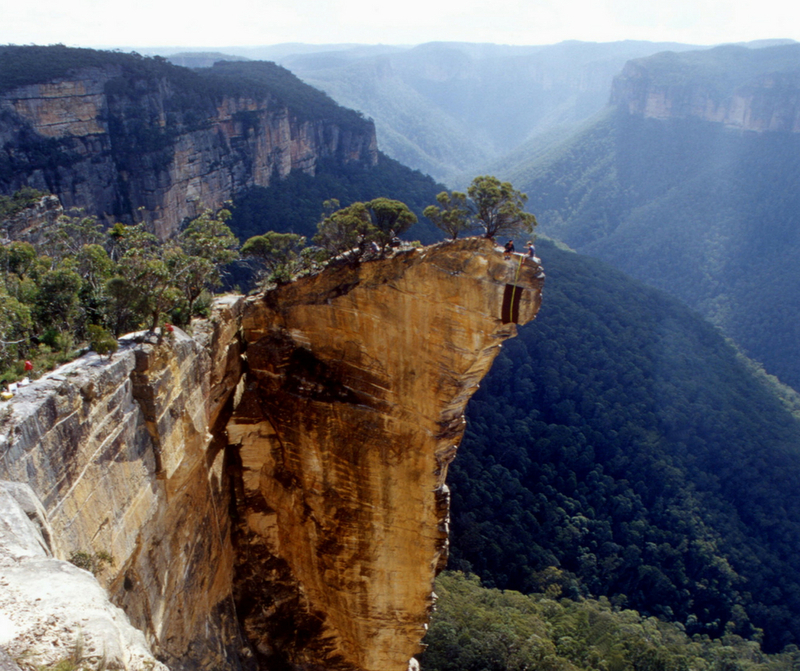 Australia is an incredibly large continent (it is also a country) and is a land of extremes. Each state of Australia offers something truly unique and promises you an unforgettable experience. A visit to far North Queensland will have you walking on beautiful tropical beaches, swimming in coral reefs and exploring amazing rainforests. The Northern Territory will present you with an arid red landscape that’s hot, dry and dusty but an abundance of many swimming holes to cool off. Heading to the Southern states will take you to more temperate climates, with rugged coastlines, green pastures, mountain ranges and even snow in winter. There are around 24 million people in Australia and 85% of those Australians live within 50 km from the coast. We certainly love our beaches and if you decided to visit a different beach each day it would take you 27 years to see them all. Australia also has the longest national highway in the world at 14,500 kilometres. 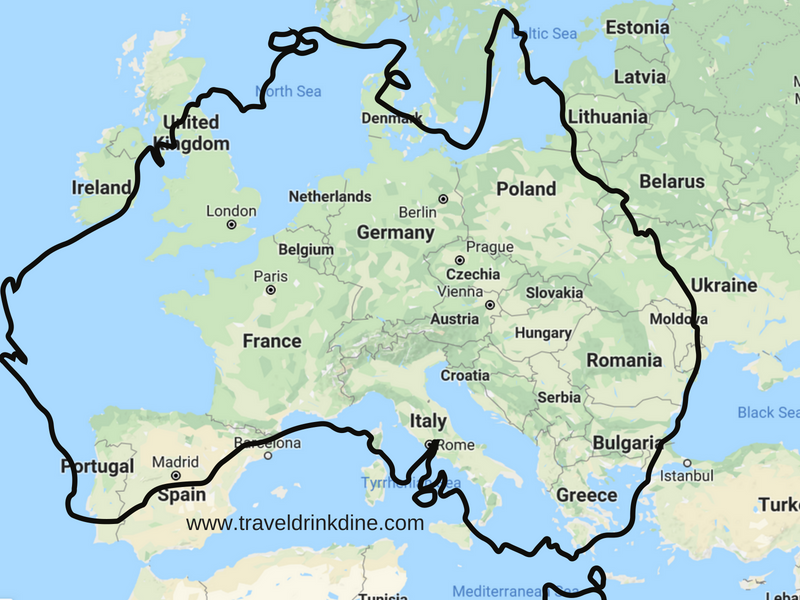 To give you a little idea on how big Australia is, then take a look at the map of Europe below, Europe fits easily inside Australia. In fact Australia is twice the size of Europe. 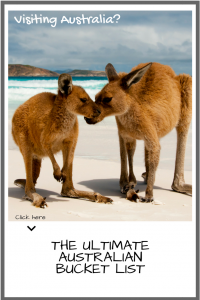 Okay, so let’s see what Australia has to offer and help you put a few or all of these places on your Ultimate Australian Bucket list! Victoria is located in the South- East of Australia and is home of the worlds most liveable city – Melbourne. 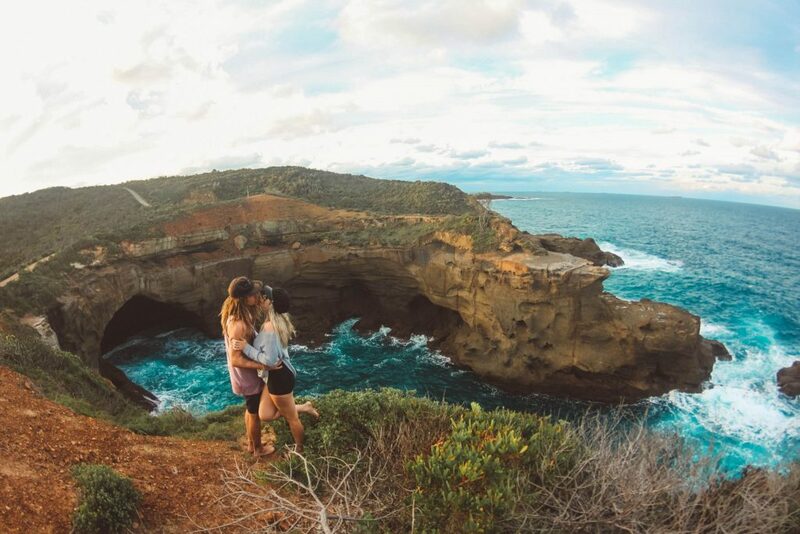 But Victoria does not end with Melbourne, venture beyond and you will find spectacular coastlines, quaint little beach towns, beautiful wineries, natural mineral springs and beautiful bushland to hike. With a more temperate climate, Victoria sees four seasons and if you are lucky, you can witness them all in one day! Melbourne, the capital of Victoria is surrounded by breathtaking beaches, and sparks a cultural vibe. This cosmopolitan city is known for It’s variety of world class dining, shopping and eye for fashion, museums and art galleries, hidden lane ways and markets, and not to mention the various sports venues. All over Melbourne you will find little hidden gems just waiting to be discovered. 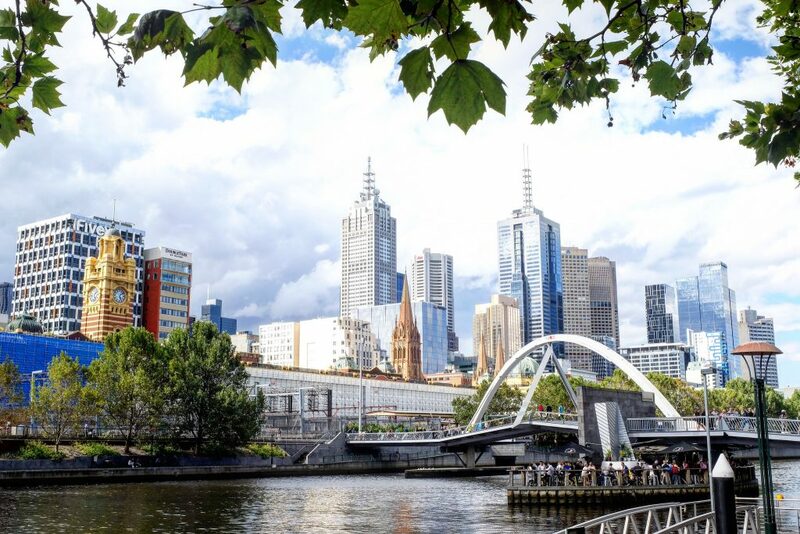 Whether you just spend your days exploring the little streets, eating in one of the various fine restaurants, attending a sports event, Melbourne is a city that will leave an unforgettable impression. Not into the city life? Melbourne is surrounded by nature and is built up on the coast. Take a day trip or head out for a weekend to the Great Ocean Road, the Yarra Valley, Dandenong Ranges, or Phillip Island for a more relaxed feel. With anything you could want to see or do so close to the city, it makes Melbourne a fantastic place to visit for any traveller. It’s no wonder that this amazing city is the most liveable city in the world. Australia can be considered a terribly expensive tourist destination. Now not all bucket list items need to break your travel. 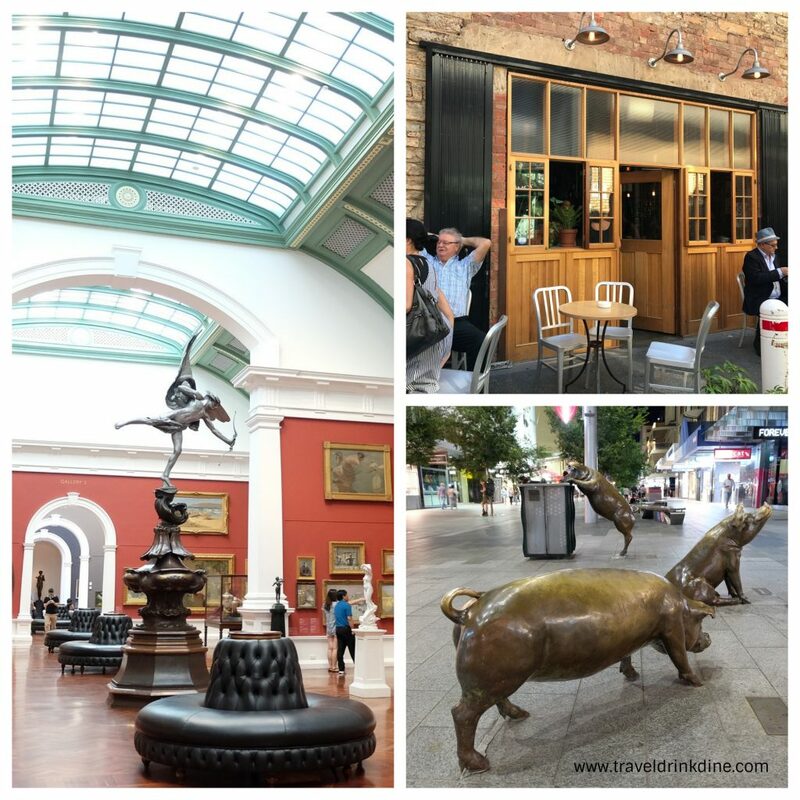 You can easily spend $10 an enjoy a wonderful afternoon or morning deep diving into a Melbourne cultural icon. 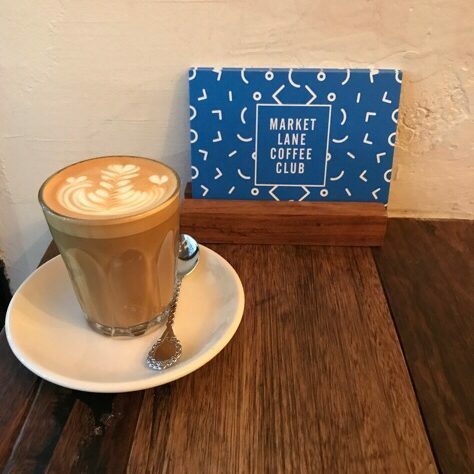 One of the best things to do in Melbourne is to grab a coffee and go walk the laneways. At most you’ll pay is $5 for a large coffee. The $10 suggested budget also gives you some wiggle room to buy a donut. So take yourself down to ShortStop donuts and grab a donut and coffee. Then wander through Melbourne’s infamous laneways and watch the city come to life through the street art. I can’t tell you which one to see, as it really is an ever changing delight. 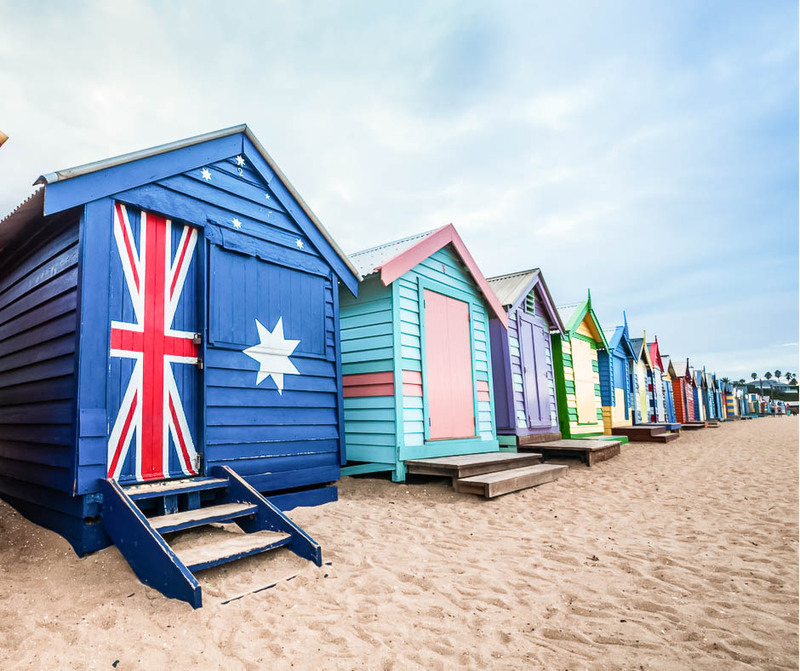 Brighton beach is iconic, and a must-visit for any first timer to Melbourne. It is without a doubt one of the best beaches in Melbourne. Not only is it great for surfing and kitesurfing, it is so beautiful and a great place to unwind, especially on a Summer’s day. But the main attraction, of course, and what makes it stand out is the beach boxes. These are tiny wooden ‘houses’ that line the beach. They are brightly painted and the artwork regularly changes. However, the most well known box doesn’t change – the one boasting the colours and stars of the Australian flag. This is the background of many backpackers in Australia’s profile pictures. On a hot day you will see lines of tourists forming just to take a picture with this box. I recently heard that Brighton beach is the most instagrammed spot in the state of Victoria, so you really have to check it out when you’re there. There’s no excuse – even if it’s not the best weather, you can still pay a visit to the beach boxes. Your Instagram will thank you! From beach to bush the Mornington Peninsula is an amazing place to explore. With stunning beaches covered in white soft sand to bush tracks up in the hills it’s all about connecting with nature, beautiful views and of course the food! Wineries cover the hills and child friendly venues are abundant for a long Sunday lunch with friends.A chance to meet native Australian animals, run through hedge mazes, swing through the treetops, engaging in local art at the galleries and swim with dolphins out in the bay. 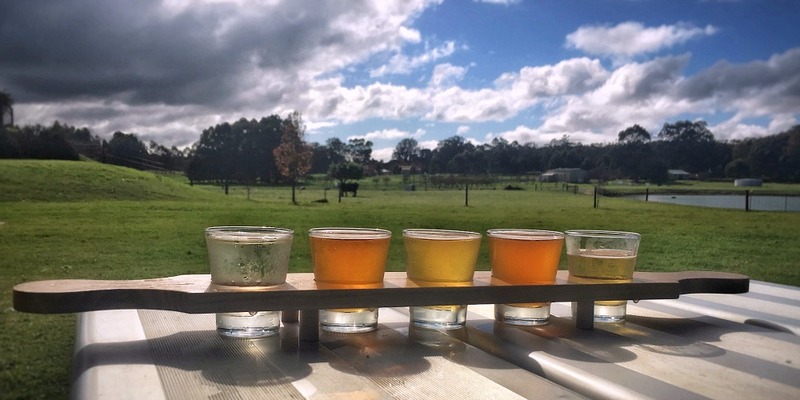 Just 2 hours from Melbourne there is something for everyone. As locals, we’ve always known how delightful the Bellarine Peninsula is. For years it remained a secret hideaway overshadowed by Victoria’s other amazing attractions. But the world has finally caught on with Lonely Planet naming the peninsula a Best Value Destination in 2017. And with its enchanting seaside villages, art galleries, boutique shopping, fine dining and historic architecture it’s no surprise. The Bellarine, as it’s known, is an easy day trip from Melbourne. But to get a true taste of the area you need to stay a couple of nights. And honestly, who wouldn’t want to curl up in a cosy B&B by the seaside for a few days? Or spend a weekend exploring local farmers markets, world class wineries, playing with dolphins or taking in a festival? The peninsula is a popular family destination too, with heaps of fun activities for the kids. Tire the whippersnappers out with a day of aquatic fun at Adventure Park. Or lose them for a few hours in the giant timber maze at A Maze ’N Games. Our kids got a kick out of eating fish and chips on the beach at Queenscliff and watching the ferry arrive from Sorento. There’s so many things to do on the Bellarine from surfing to diving to playing a round of golf, it’s impossible to list them all. But it also offers beautiful scenery, nature and wildlife and some of Australia’s oldest history. Make sure you put it on your Australian Bucket List. 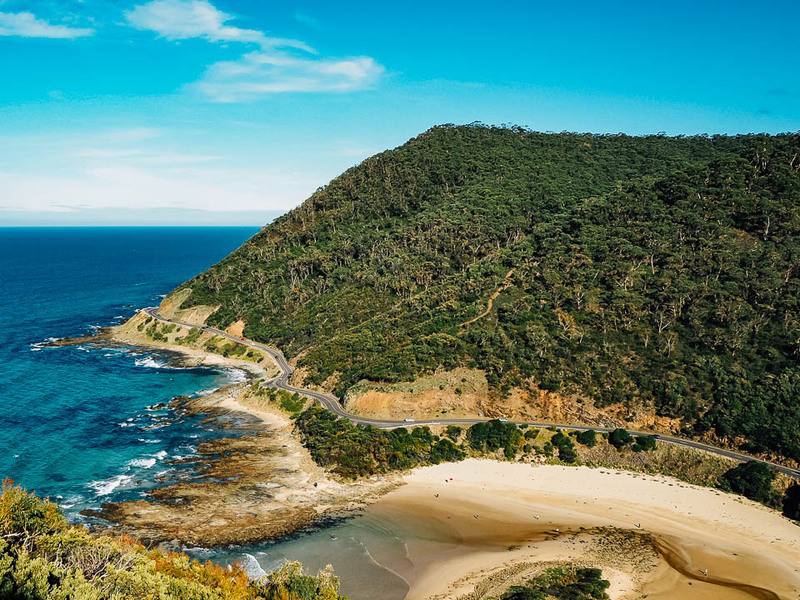 One of the world’s most iconic drives, the Great Ocean Road near Melbourne, passes through some of the most spectacular scenery in Southern Australia. The road winds along 250km of rugged coastline, past windswept beaches and through pristine rainforest. Most famous for the huge rock formations known as the Twelve Apostles, there are many other attractions along the Great Ocean Road. 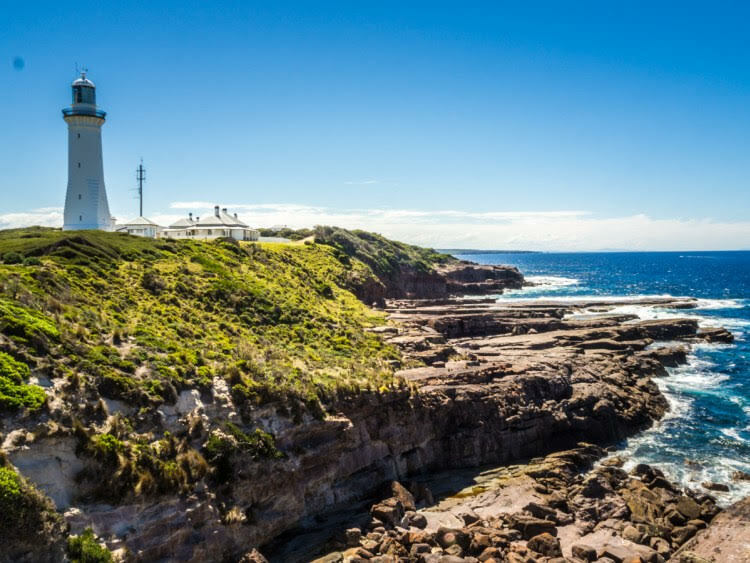 Walk along wide sandy beaches and take in the incredible views from the Cape Otway Lighthouse built to protect ships passing along what is known as the Shipwreck Coast. Make sure to stop at Kennett River and do the short walk along a path through a forest that is home a colony of sleepy koalas. If you like hiking there are several walks to pretty waterfalls surrounded by ferns. When you get hungry, stop in one of the small towns and hamlets that hug the coastline. Here you will find craft breweries, coffee roasters and eateries making the most of the abundant local produce. We love the General Store at Wye River and the fishing cooperative in Apollo Bay where you can try the catch of the day. 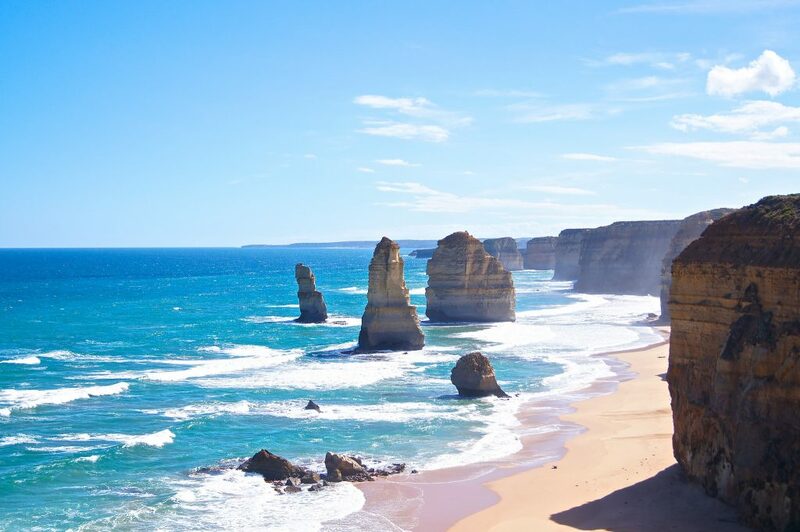 You can visit the Great Ocean Road as a day trip from Melbourne but to appreciate it fully, hire a car and spend a few days exploring this beautiful part of Australia. One of the best-known tourist destinations in Victoria is the 12 Apostles in the Port Campbell National Park, near the end of the Great Ocean Road. Formerly known as the ‘sow and the piglets’ the rock formations have been carved from the limestone cliffs over many thousands of years due to the erosion from the relentless crashing of waves. The ‘Sow’ was a large formation that is now called Mutton Bird Island in the Lorch Ard Gorge section of the park and the piglets were the smaller stacks. The 12 Apostles viewing platform wraps around the cliff top, providing views to the largest group of limestone stacks and then back towards two more stacks that can also be seen from sea level. Visitors can walk down ‘Gibson’s Steps’ which consists of 88 steps that were carved into the cliff face over a 100 years ago, to access the beach. Helicopter flights operate daily from near the 12 Apostles car park and can definitely be recommended as a fabulous tour to add to the experience. The drive directly to the 12 Apostles from Melbourne takes about 3 hours, Port Campbell is the nearest town where there is plenty of accommodation options to choose from if you have time to stay and explore further. The nearby Loch Ard Gorge has some wonderful walking trails and historic markers to read along the way. Gippsland is the biggest region in Victoria and is also home to some of the least populated and most remote areas of Victoria. Gippsland runs from the outskirts of the eastern suburbs of Melbourne all the way to the New South Wales border. Gippsland is so big it is broken up into 4 parts, South Gippsland, East Gippsland, West Gippsland and the Latrobe Valley area. Gippsland has over 29 National Parks and is characterised by its coastlines and rolling hills in the West and South Gippsland, it’s largest commercial centres in the Latrobe Valley and the mountains and lakes in East Gippsland. Some of the highlights dotted across this amazing area are Phillip Island, famous for its fairy Penguins, Wilson Promontory, the most Southernly point of Australia, the Gippsland Lakes, with the largest inland lake system in Australia and the Croajingolong National Park a UNESCO World Biosphere Reserve. Plan a day out and visit Coal Creek Heritage Park, Walhalla a Colonial era town or Dargo the most remote town in East Gippsland. Catch a shark on the 90 mile beach near Seaspray, go skiing on the Great Alpine road at Mt Hotham and don’t forget to grab a wine and amazing food at one of the many Vineyards scattered across the region. 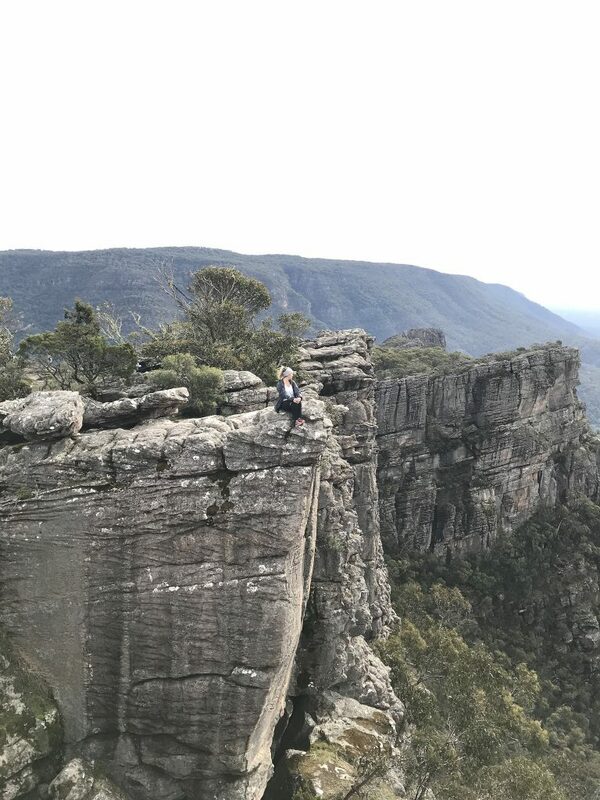 The grampians is a National Park in Victoria, were you can hike to waterfalls, cliff edges and spot native Australian wildlife. Stay in Halls Gap, which is a little town at the base of the Grampians. If you want to see kangaroos and emu, you will be able to see them all over the small town as they wander freely about. Hiking in the grampians range from short walks of 1-2 km or longer all day hikes for the more experienced hiker. The Grampians is around a 2 hour drive from Melbourne. We recently spent almost two months in Australia during our family gap year. We had so many amazing experiences during that long stretch, but a real highlight for us was roadtripping from Melbourne to Sydney along the coast. It’s a stretch that most people skip, even many Australians. 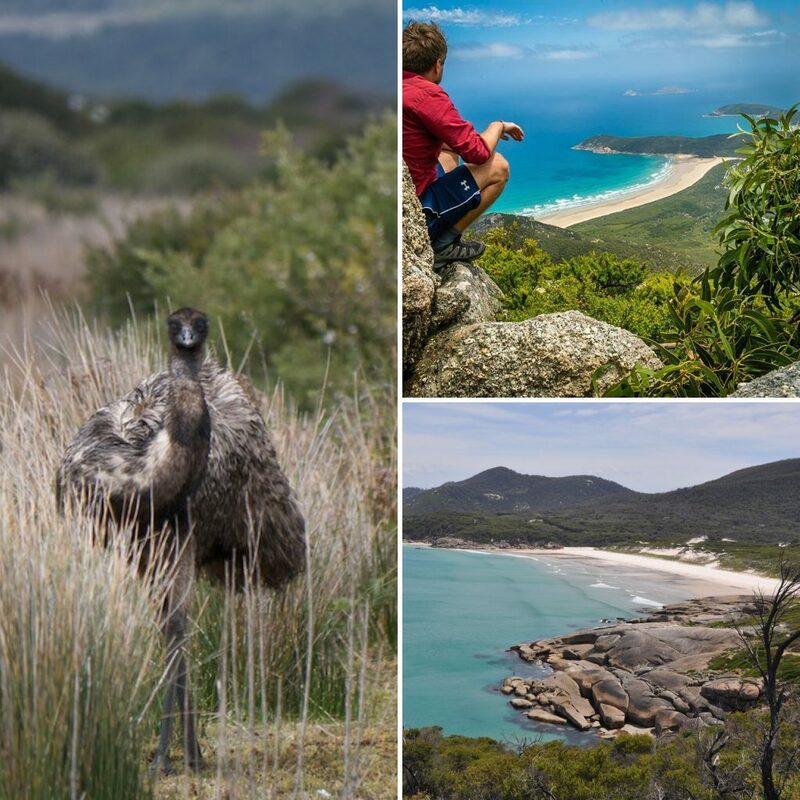 But the region has 1000km of unspoiled coastline dotted with gorgeous seaside villages, untamed national parks, secluded beaches for swimming and nearly every Australian wildlife encounter you could hope for. Our favourite stops were on Raymond Island to visit its native koala population and in the larger town of Narooma. While we didn’t stay in Narooma, we wish we had! In one afternoon we watched enormous rays traversing the bay, grinned at fur seals goofing off along the jetty and snorkelled with thousands of fish in a protected cove surrounded by soft golden sand. Check out our complete guide to driving the Sapphire Coast here. New South Wales is home to one of the worlds most recognisable cities – Sydney. Boasting a world famous harbour, the iconic Opera House and the Harbour Bridge, Sydney is a sight to behold. 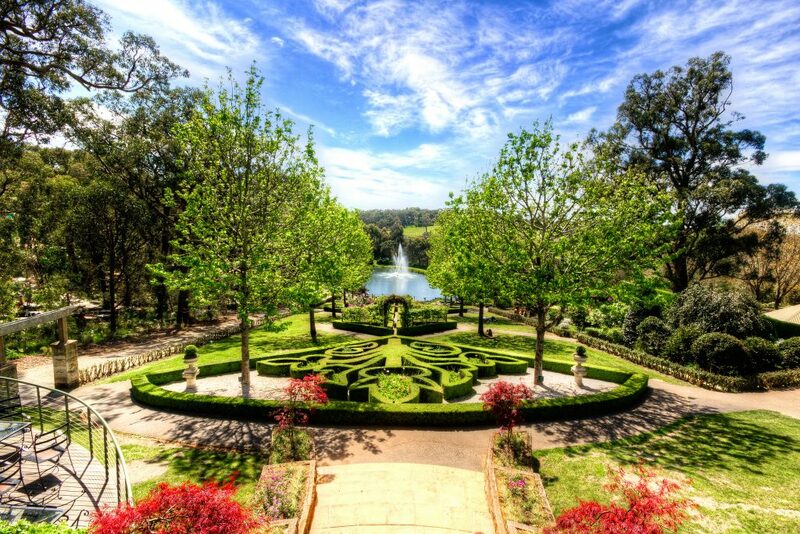 New South Wales also has plenty to offer a little further afield. Beautiful beaches, ocean pools and cruisy coastal towns make for a relaxed vibe. 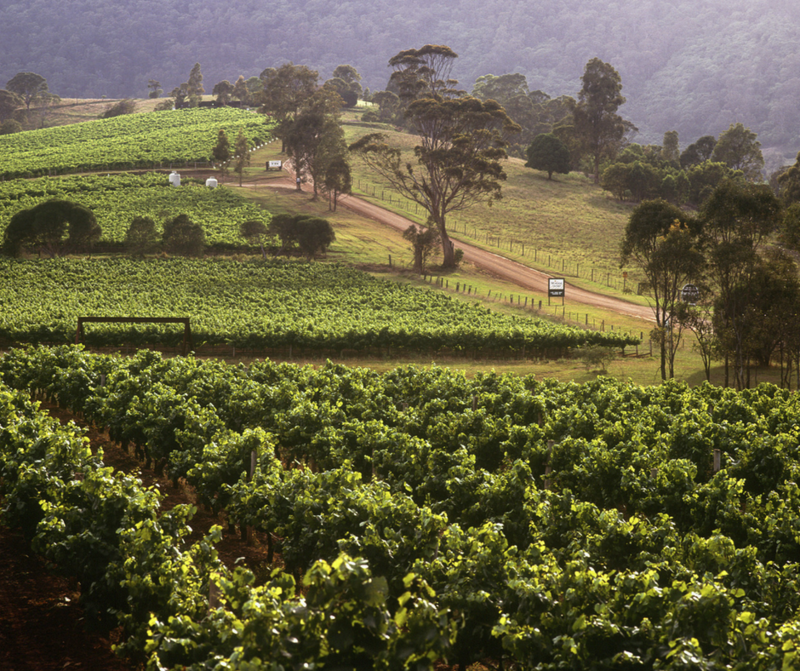 Head inland and you’ll find yourself exploring the Blue Mountains or sipping wine in the Hunter Valley wine region. 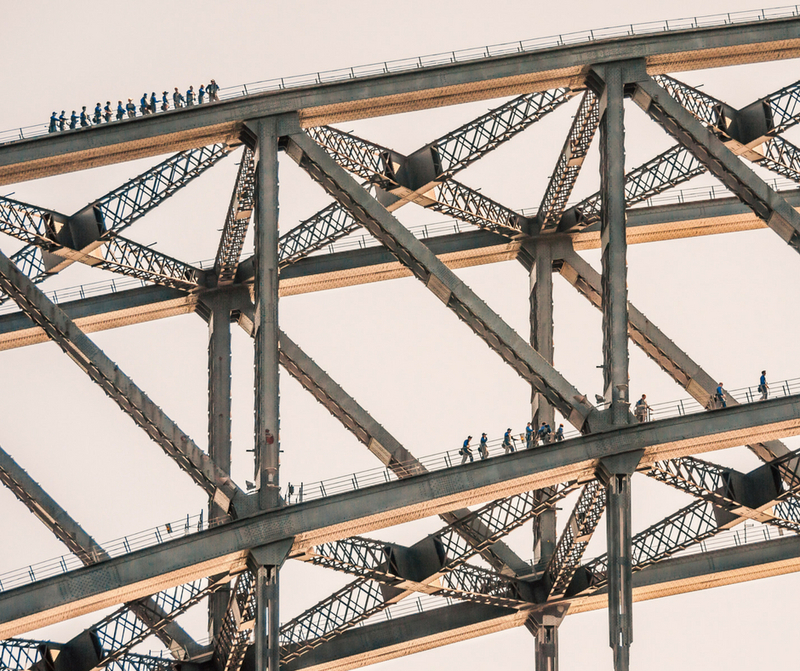 The Sydney Harbour Bridge is one of Australia’s most recognisable sightseeing activities, most people though, would be content with taking a few photos from a couple of different vantage points. Although for some, that’s just not enough. Some would just have to climb it. I’m one of latter! We had the opportunity to live in Sydney for a couple of years and it didn’t matter how many time we saw the Sydney Harbour Bridge, it always caused a lot of excitement. Towards the end of our stay I decided to book the Sydney Harbour Bridge Climb as an anniversary gift for my husband and I. I decided we would go up just on dusk and would hopefully get some lovely sunset views. We had a stroke of luck when we got to the very top, just as we were having our photos taken, a set of fireworks went off at the Sydney Opera House right behind our group in the photo. We were so unbelievably lucky and we were able to stand on top of the Sydney Harbour Bridge and watch the fireworks show. The Bridge Climb is definitely expensive but it’s a once in a life time experience and I think it was definitely worth the money we paid, the fireworks were a bonus but of course I told my husband I organised that too! 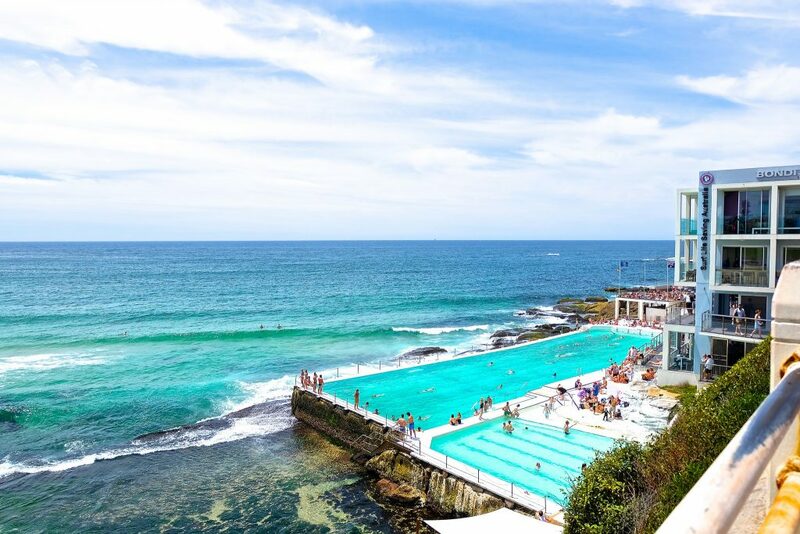 If you enjoy a swim then head over to Sydney’s most iconic pool, Bondi Icebergs. Iceberg’s is the most beautiful of Sydney’s many rock pools, these are swimming pools build into the rocky headlands of beaches. There are dozens to swim in around Sydney, but Icebergs is special. The views over Bondi Beach are superb, the pools themselves are terrific for both serious lap swimmers and serial splashers. There are two pools, the 50m pool has lap swimming, the 25m pool is great for relaxing, ideal for kids too. There’s a small charge to enter Icebergs, this includes entry to the sauna. The pools are open all year from 6.30am to 6.30pm, though closed most Thursdays for cleaning. Lifeguards are always on duty. A winter swimming club, the Icebergs, was founded in 1929 by local life guards who wanted to keep fit and train over winter. This is still going strong and is one of the biggest winter swimming clubs in the world. It’s said to be the only licensed one! The swimming club was always based at the rock pool at Bondi which assumed their name, Icebergs. 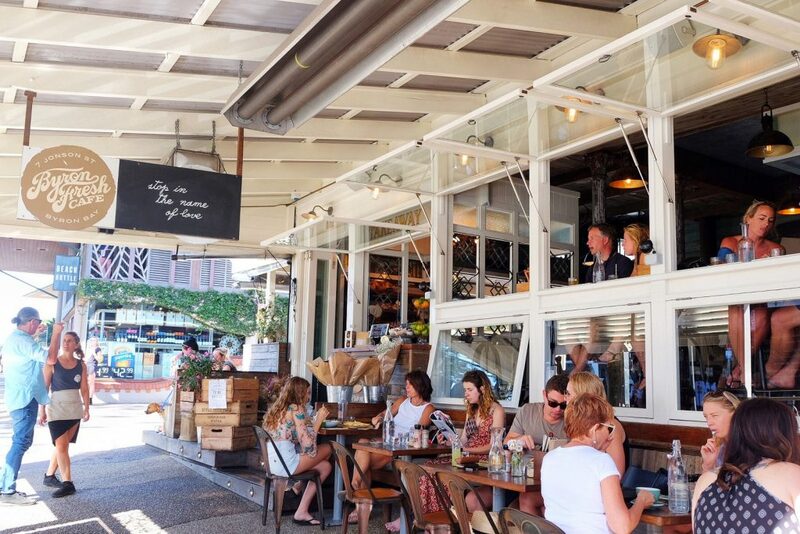 Insider tip: see the beautiful people of Bondi at the pool on weekends; after your swim enjoy a snack at the kiosk or go upstairs to Icebergs Dining Room and Bar, one of Sydney’s best restaurants. See more photos of Icebergs at link below. 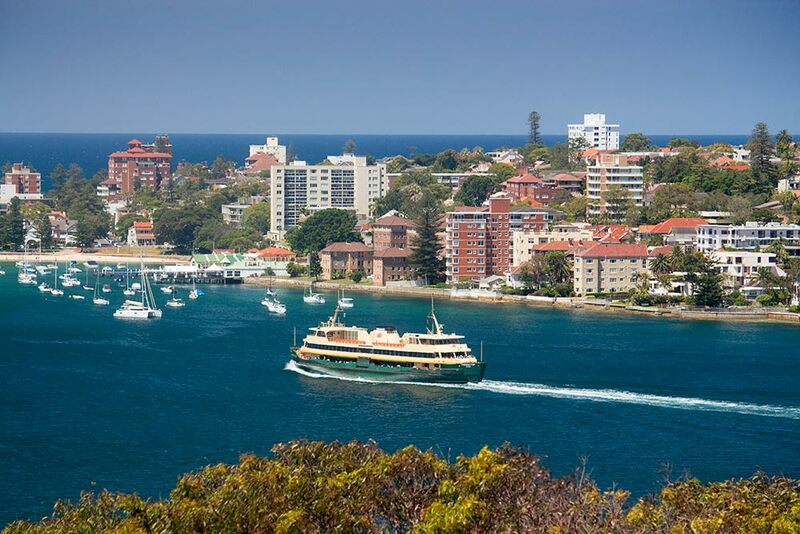 The Manly ferry, which runs from Sydney’s ferry hub Circular Quay to the beach suburb of Manly, is one of the best public transport journeys in the world, and our recommendation for the ultimate Australia bucket list. The half-hour journey takes you out from the shadow of the city’s skyscrapers, past its two greatest icons, the Opera House and Harbour Bridge. It then heads out to Sydney’s suburbs, taking you on a trip through one of the most beautiful natural harbours in the world. You pass a naval base, Taronga Zoo, long stretches of untouched bushland and some of the most expensive real estate on the continent. Eventually you pass Shark Bay in Vaucluse, before swinging north and passing between North and South Heads, briefly taking the brunt of the Pacific Ocean wind and swell. As you move north into Manly Cove, the waters are more sheltered again. You disembark at Manly wharf, from which it’s a few minutes’ walk along the Corso, Manly’s shopping strip, to Manly Beach. When travelling in summer sitting outside is much more enjoyable than being inside. That said, if it’s ferociously hot it’s best to grab a seat away from the direct sun on the shaded side. So travelling from Circular Quay to Manly you need to be on the starboard side of the boat, and coming back later in the day you need to be on the port side. Just 2 hours north of Sydney lies the second biggest city in New South Wales – Newcastle! Nestled between golden beaches on one side and the Hunter Valley – the states biggest wine region on the other. Right on the City’s doorstep are beautiful Sandy Beaches line the coastline. Among these are multiple ocean baths if the waves aren’t your scene. Visit the city in Summer and witness an international surfing competition at the famous Mereweather Beach or take a walk along the coastline in the colder months to watch the humpback whale migration. Three main dining precincts are scattered through the main part of the city with a range of tastes to suit any appetite. Dine and Watch the sunset over the harbour at Honeysuckle or relax as the busy city life passes you by at Darby and Beaumont Streets. If the city life isn’t your scene then take a short drive into the heart of the Hunter Valley where you can take a tour through the vineyards, watch a concert under the stars or simply sample the abundance of wine available. Whether your interested in Eating, Drinking, or Playing – Newcastle has what your after. The Blue Mountains are only about a two-hour drive from Sydney, but you feel as though you are on an entirely different continent. I was astounded by how such a short drive can transport you to another world–one filled with some of the strangest wildlife in the world like the lyrebird, kookaburra, and the Sydney Funnel Web spider. The mountains themselves are the main attraction. I found it hard to capture the sheer epicness of their size and color. The national park is a haven for hikers and casual tourists alike–there are trails that suit both beginners and intermediate nature lovers. Finally, no trip to Australia is complete without seeing the famous “Three Sisters.” While the legend might not have been correctly translated from the aboriginal language, they are an instagrammer’s dream. I spent a whole day exploring this region, but it definitely did not seem like it was enough. There is a reason so many make the trip to see the stunning views, numerous waterfalls, and yellow cliffs that change colour with the sunrise. One of the most fun days I ever had in Australia combines my two greatest passions in life: cycling and wine. My husband was competing in the World Duathlon Championships which, that year, was held in Newcastle, a couple of hours north of Sydney. 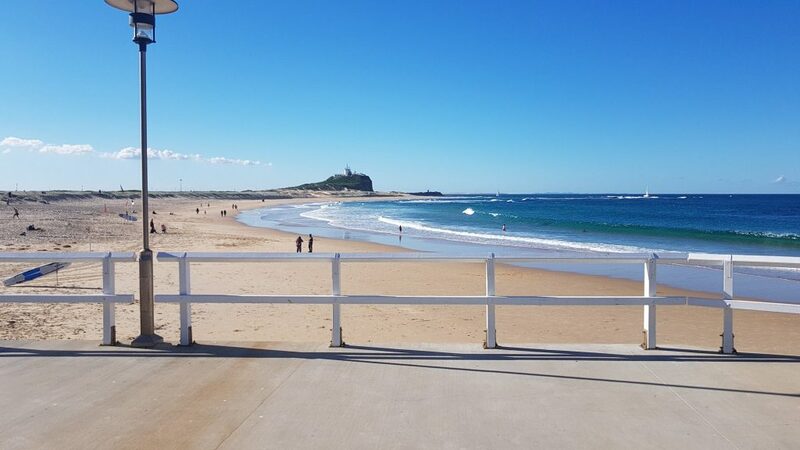 My husband finished the race, jumped in the ocean to cool off and an hour later we were in the car on the way to the beautiful Hunter Valley, just an hour or so west of Newcastle (if you’re planning a trip from Sydney, it’s about a two hour drive). We spent the afternoon in Australia’s oldest wine growing region, quaffing delicious Semillon and Shiraz at notable wineries such as McGuigan Wines. 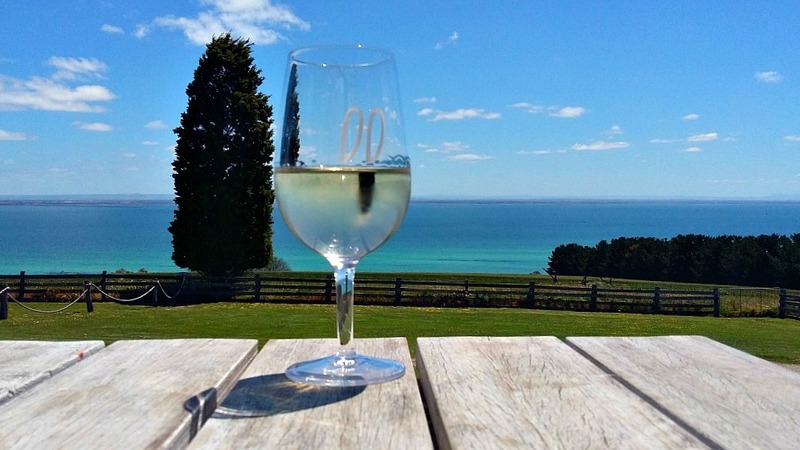 This incredible part of the world has more than 150 wineries, so the real problem is selecting which ones to visit (and finding someone willing to drive)! The sun was warm, the wine was delicious; all in all, a perfect day. After a recent road trip from Sydney to Cairns with some friends, I was surprised, but not shocked to find out that each one of us had said that our favourite part of the trip was our stay in Byron Bay. Even after passing through so many fantastic spots, we knew Byron was going to stand out as we drove in. Byron Bay first exposed itself to us as a spectacular vista from the road. The town sitting at the foot of the mountains almost blending into the sea. We had the feeling that we were somewhere pretty special. The place had an infectiously cool vibe about it, we were told by a local that Byron Bay is at the heart of an extinct volcano and below or near the town there were crystals that gave the town it’s beautiful energy. Whether you believe that or not, it doesn’t matter. Because after a few days of enjoying the squeaky sand on the beautiful beaches, or the world class surf, indulging in some yoga, massages, great food and nightlife… you won’t care. And the only thing you going to care about is how to get back again. When putting together my post on the best beaches in Australia I stumbled across a beach with the whitest sand in the world! Turns out that it exists not too far from Sydney in Australia and is even confirmed by the Guinness Book of World Records to have the whitest sand on the planet! The sand is so white because it is completely composed of pure quartz and it juxtaposes brilliantly next to the crystal clear waters of the Australian East Coast. I was told the beach is particularly beautiful at sunrise when the sun comes up behind the ocean. Frequently, there are even dolphins in the waters surrounding this beach! However, this famous beach can often be cursed. During high season, so many people flood to come and see it that the narrow streets become clogged and parking are impossible to find. Being a small beach it can sometimes even be impossible to see the beautiful sand due to so many bodies laying over it! Australia is renowned for their pristine beaches and breathtaking coastlines. 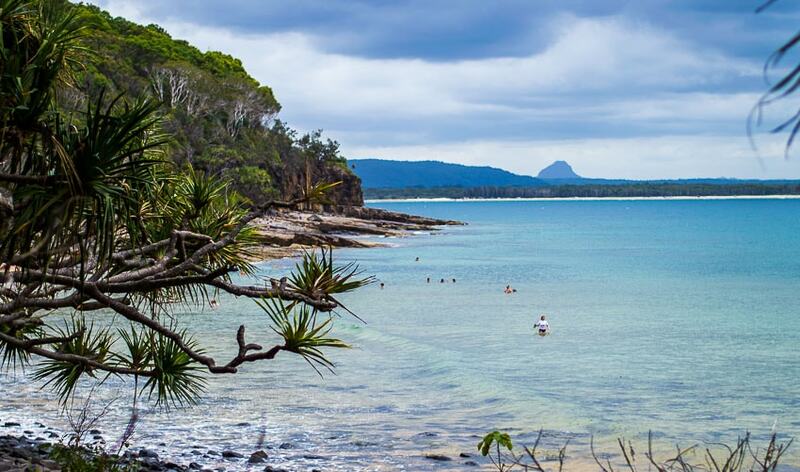 We were lucky enough to grow up at some of the most beautiful beaches and National parks on the NSW Central Coast. Living in a popular tourist destination means that our beaches, roads and shops pack out during summer. However, Wyrrabalong National Park is the Central Coasts best kept local secret! We’d go bushwalking along the jagged limestone coastline looking out at the breathtaking Pacific Ocean. In winter we’d grab our blankets, cheese platter and bottle of wine as we watched the whales migrating north. On a hot summer day we’d take the long boards out and surf with the dolphins. It’s no wonder the Central Coast is such a popular tourist destination! Overlooking Fraser beach are beautiful and cheap campsites, which cost only $30 a night. Wyrrabalong National Park is perfect for weekend getaways, with easy bush walks and a lagoon nearby for kids to swim. Just around the bend is Snapper Point, a popular rock-fishing and bird watching spot. Wyrrabalong National Park is by far central coasts best kept secret, so make it part of your Australia travel bucket list! Queensland is the state that many Australian’s head to for holidays. 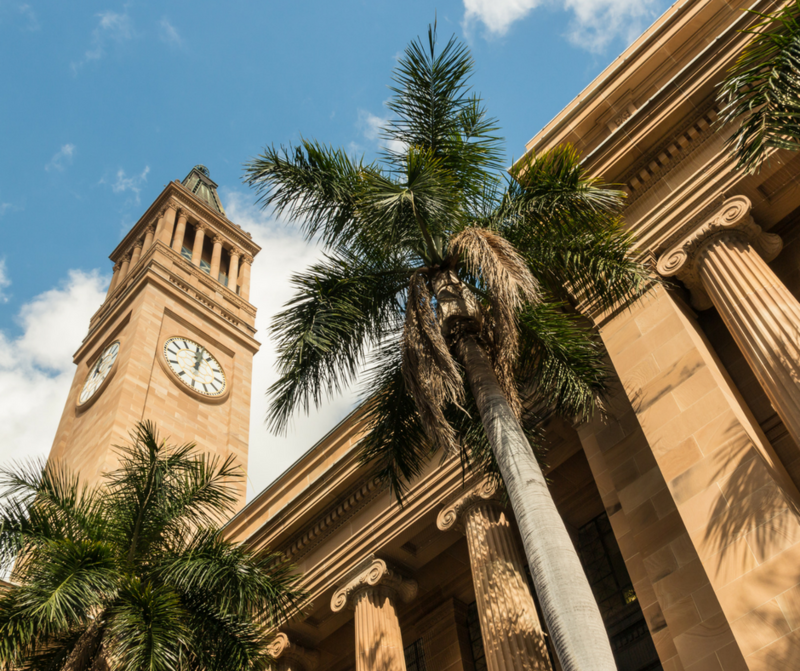 The capital city is Brisbane, which can be overlooked on tourists radar. Many tourists head to the glitzy Gold Coast with it’s perfect weather and party vibe. Surfers paradise is a favourite with Australian families, with plenty of beach time and close to the big theme parks. Head North and you’ll find yourself in the real paradise of Far North Queensland, experience the Great Barrier Reef, the Daintree and sail around some beautiful tropical islands. I always recommend tourists and interstate visitors go on the Brisbane City Hall clock tower tour. The tours go every 15 minutes and you’ll be up inside the clock face when the bell strikes. The views are pretty amazing and it’s just something a little bit different. The best part is that it’s free. There is a high quality (not tacky) shop for gifts. The clock tower is located in the centre of the city it is easy to get to and you can pop into the Queen Street mall shops on the way. If you’re looking for other ideas check out my Ultimate South East Queensland bucket list. I love a stunning beach and in Australia we certainly aren’t short of them, but my all-time favourite Australian beaches can be found in the Noosa National Park. The entrance to the Noosa National Park is just a short stroll or drive from the famous tourist strip of Hastings Street. From here you can easily walk along the Coastal track to beaches such as Little Cove, Tea Tree Bay, Granite Bay and Winch Cove. With the back drop of the lush Noosa National Park and the calm crystal clear water, these beaches are without a doubt some of the most stunning in Australia. These beaches are perfect for swimming, snorkeling, kayaking, or stand up paddle boarding. When the tide is out the waves pick up just enough for some gentle boogie boarding too. My favourite beach is probably Little Cove, but highly recommend walking a little further to one of the further beaches along and you may well have the entire beach to yourself – your own slice of paradise! One of the things you have to do when you are in Australia is see the Great Barrier Reef. The Great Barrier Reef is the world’s largest coral reef and extends 2,300 km along Australia’s east coast. There are a number of convenient places to experience the Great Barrier Reef, but Cairns and the Whitsunday Islands in Queensland are the most popular. I recommend making sure you visit the Outer Reef to see the most vibrant colour and most underwater life. Even if you are not a confident swimmer, you can still experience the reef by semi-submersible submarine, glass bottom boat and underwater observatory. 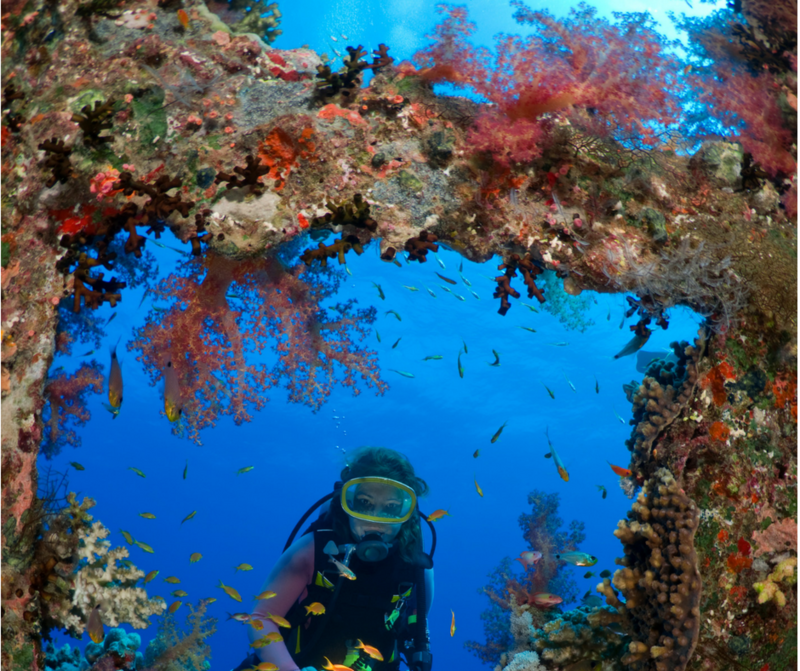 Alternatively you can dive and snorkel the Reef on a one-day tour or a multi-day live aboard. There has been much coverage in the media about the bleaching of the Great Barrier Reef and coral reefs around the world. 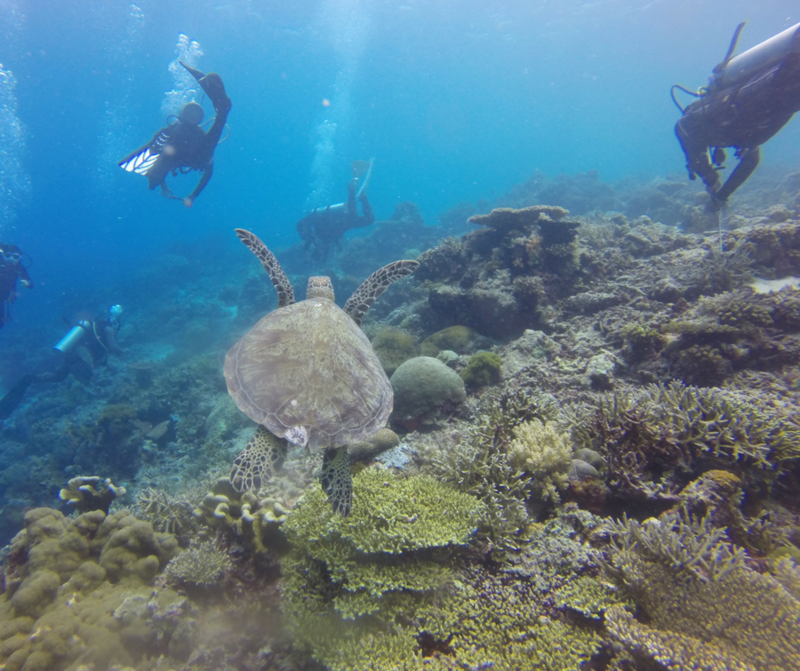 We did see evidence of that, but we also saw incredibly healthy coral and a wide variety of marine species, including turtles and sharks. Visiting the Great Barrier Reef should be on every one’s Australian bucket list. 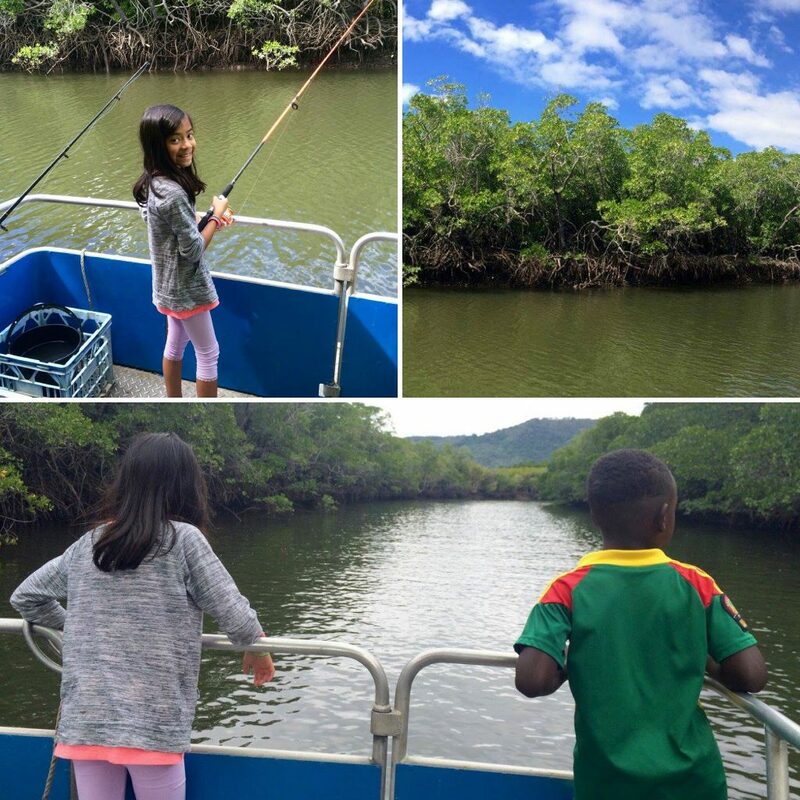 Make a memorable day by renting your own pontoon boat for a half-day and taking the kids fishing on the canal near Port Douglas, not far from Morey Reef. Port Douglas Boat Hire makes it easy for a family or group of friends to hire a small, easily maneuvered pontoon boat with all the fishing tackle, bait, and coolers you need for the day. At $159 for 4 hours, this is affordable fun for independence on the water. I especially like how they describe the boats as stable and ‘unsinkable’! Lots of extras are available too like fishing rods and handlines, BBQ, ice, drinks and more. We caught fish constantly, saw several huge crocodiles lounging on the sandbars, birds and several huge crabs. Bring bug spray for no-see-ums during certain times of the year, and although it is covered, sunscreen is useful too. Pontoon boat hire is available from Port Douglas Boat Hire located at Berth C1, Crystalbrook Super yacht Marina. Enjoy a day on the water adventuring in Australia’s magnificent outdoor estuaries! Sailing the Whitsundays is a very popular activity by travellers of every demographic visiting Australia. However, whether you are from abroad or have grown up in Australia, you definitely need to make time for this incredible experience. You get your own private sailing experience (and lesson if you want it) while touring some beautiful remote islands and get to fit in each and every activity you can muster the energy for: snorkelling, stand-up paddle boarding, hiking, and more! Not to mention, Whitehaven Beach, one of the most postcard worthy spots in the world is found in the Whitsunday Islands and viewing it from atop Hill Inlet will make you feel like you are living in a dream. Interesting Fact: it is said that the sand on Whitehaven Beach is so pure, that it was used to make the glass for the Hubble Telescope. Does that make you want to dig your toes in?! 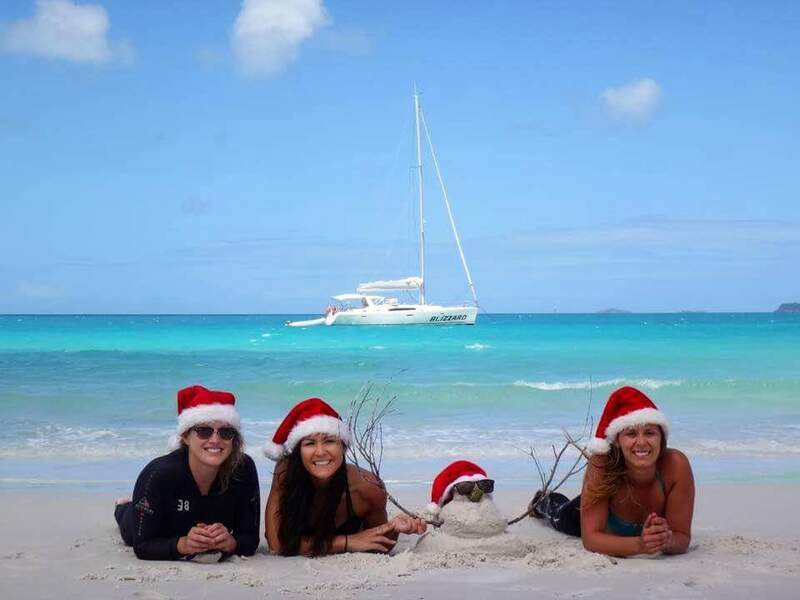 Important Tip: there is a type of tour for every kind of traveller aboard a sailboat in the Whitsundays, but if you want the most personalised experience, I recommend booking a smaller boat. When there are only eight passengers aboard the boat and two crew, you get a much more unique and customised experience. 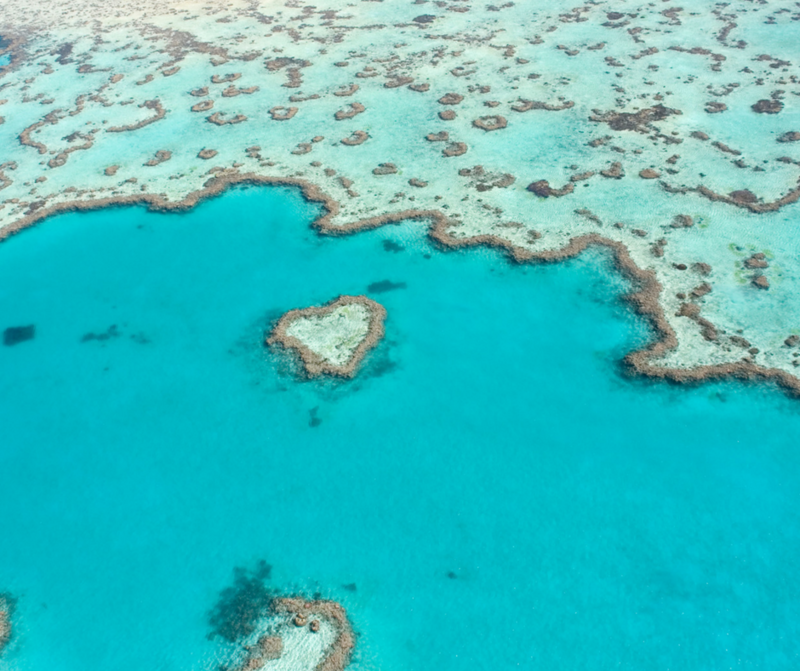 Australia has no shortage of scenic sites but even for Australia the heart reef in the outer Great Barrier Reef is a site that is sure to impress. After hearing about a deal that a fellow backpacker scored on a scenic flight over the Whitsunday Islands and the Great Barrier Reef I decided that my backpacker budget could make do with this splurge that I soon deemed worthy of the cost. Despite my fear of flying, especially in small planes, my fear associated with the activity that I embarked on was both far from my mind as the vibrant blues, green and mix of turquoise colours of the Great Barrier Reef shined brightly through the waters surface. The small plane made deep turns to showoff Whitehaven Beach, named one of the most beautiful beaches in the world, as the group of islands that were covered in trees, rising out of the stunningly blue waters. If you’re going to take any flights or make any splurges during your Australia trip a scenic flight from Airlie Beach must be at the top of your list. Make sure to walk down the main street and ask a number of tourist agencies their price, one will always have a deal. 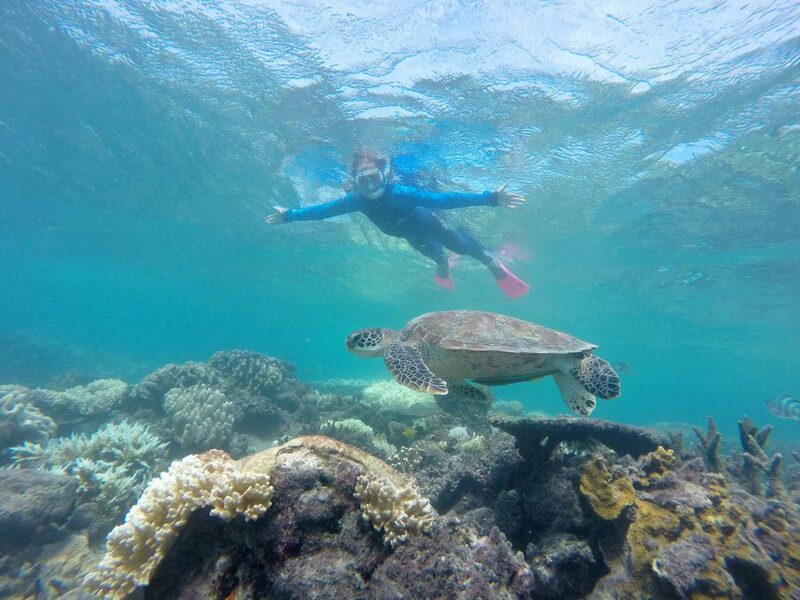 If your Australia Bucket List includes a visit to the Great Barrier Reef and a swim with friendly turtles in a crystal clear, protected lagoon then Lady Elliot Island is where you need to visit. Located on the southern Great Barrier Reef, just a short flight from Hervey Bay, this little coral cay is home to incredible marine life and the island resort Lady Elliot Island Eco resort which makes little impact on its pristine surroundings. Jump off the plane, grab your snorkel gear and choose from the shallow lagoon where turtles and reef sharks swim and play, or the deep water reef where you can spot lines of feeding mantas, sharks and the occasional whale shark. The island team are experts in their fields in marine science, and as well as guiding you on snorkel trips, reef walks and nesting turtle spotting, each evening they present talks on the ocean and marine life, helping to educate guests about life under the sea and what we can do to protect our oceans. Two to three days is a perfect stay here, but you can also take a day trip from the mainland. If you’re staying on the island delicious meals are included, kids movies are played each night and there is a swimming pool and kids club for when parents want to go diving or explore sans-kids. We love this island and we know you will too. Do you want to hang out with this little guy? That’s a silly question – of course, you do! Who wouldn’t! If you’re traveling through North Queensland, you definitely need to make a stop at Mareeba to visit the Granite Gorge nature park. Here you will encounter wild wallabies (well ‘wild’ meaning ‘free’, but tamed through repeated human exposure). 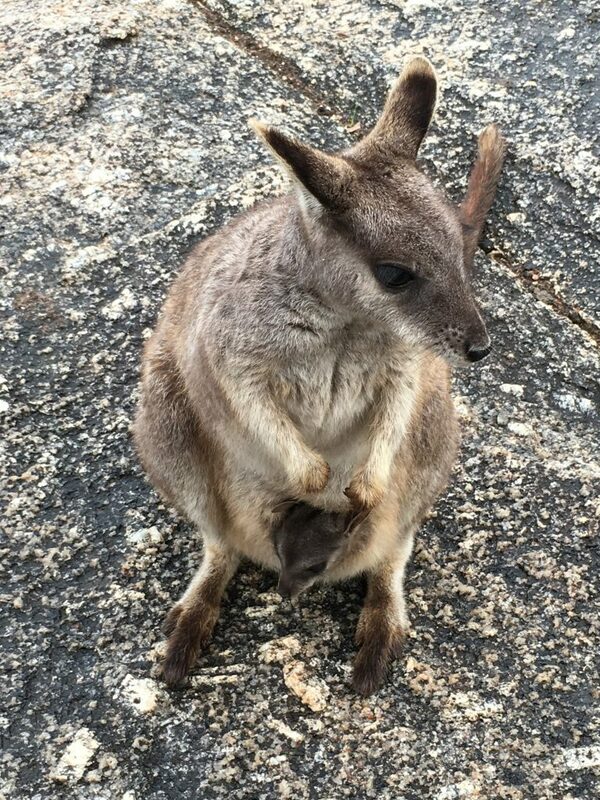 Upon entering this private park, you can purchase wallaby feed and they will eat the food right from your hands! They are not camera-shy so expect a lot of selfies going on. Best way to avoid this is to visit early in the day or around dusk. When I visited, I camped on the property so I could find the least crowded times to hang out with my little new friends. Unfortunately, while setting up camp, I accidentally locked my keys in the trunk of my car (pro tip: don’t do this – it’s not fun), but that’s a story for a different day! Do you love diving and see the world that is bellow in the sea? Then you can’t miss this experience. On 1911 the S.S Yongala sunk on a cyclone while carrying 122 passengers. The Luxury Steam Ship was lost for more than 50 years when founded just 12 nautical miles from Alva Beach and 48 nautical miles from the Townsville. It is lying on a sandy bottom only 98 feet from the top on its deepest side. It’s the largest and more intact historic shipwreck in Australia, and famous for the amazing conservation of the ship itself and the marine life that you can find there. When we talk about marine life, it’s not like any other places you can dive. Here every creature is big, like they give the fishes steroids. You will find giant marble rays, giant barracudas, sea snakes, giant gropers and many more all surrounding a wreck incrusted by amazing coral; and if you are lucky you can find even sharks and turtles (of course, big too). It is forbidden to get in the ship because it’s protected, but you can dive all the surroundings. This should be in the bucket list of any diving fans, and we promise it would be one of the best diving spots you would ever go to. At only 35 kilometres from the mainland Moreton Island is close to Brisbane. A 90 minute ferry ride departing from Brisbane’s Pinkenba wharf, drops passengers at the Tangalooma Island Resort jetty where you can walk the island’s white sandy beaches or ready yourself for any number of adventures. For those who love the water, try diving and snorkelling around the submerged wrecks, or if preferring to stay on land, consider a 4WD tour on the island’s many tracks. As the third largest sand island in the world, there are no sealed roads on Moreton, apart from the couple servicing the Tangalooma Island Resort. Professionally managed by the Tangalooma Island Resort’s Marine Education centre, many of staff have a marine biology background. They educate the public on these special marine creatures. There is strict supervision to ensure the wild dolphins are not harmed in any way. You can choose either a day cruise, which ends with the evening feeding session, or if you want to explore more of Moreton Island and decide to stay at the resort, the wild dolphin feeding is included in some accommodation packages. Because the dolphins are wild, there are no guarantees which family members will turn up on any given night. Tip: You’ll be in the ocean so be prepared to get wet and enjoy! Visiting the NT is like taking a step back in history, approximately 60,000 years in history in fact! A deeply spiritual land that will touch you like no other and one of the most remote places in Australia. Most journey’s to the NT begin in Darwin, famous for it’s stunning sunsets along Mindil beach. Day trips from Darwin can see you swimming in natural billabongs (pools) and hot springs. Cultural areas of significance such as Kakadu, Arnhem Land and Uluru where you can learn about Aboriginal culture and observe ancient rock art. Want to make your mom really proud? Send her a text message that you’re about to enter the Cage of Death and that you’ll call her if, I mean, when you get out. 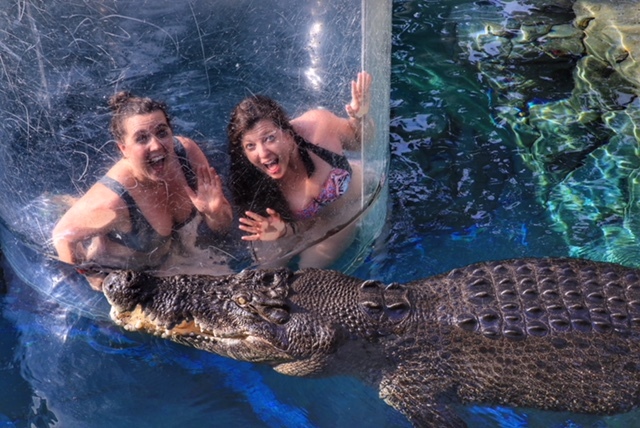 At Crocosaurus Cove in Darwin, you can hold a baby crocodile named Fluffy and swim with his big brothers and sisters in Australia’s only saltwater crocodile dive. From the moment I learned about the opportunity to swim with the world’s largest reptile, it went on the bucket list. And when planning my recent NT and WA adventure, this was the only non-negotiable on the itinerary. It didn’t disappoint. I had nerves of steel until the moment came to climb into the clear 360º tube, which was lowered into Will and Kate’s pool. Fear melted away as the water rose in the tube and we were able to dive down to see the crocodiles up close. I was surprised at the unique pattern and texture of their skin and their perfectly white teeth. At the end, we were raised just out of the water, where we got one more chance to look these prehistoric beasts in the eye. I have a much greater respect for how beautiful and dangerous these crocodiles are, now that I’ve seen them up close. And my mom was relieved to hear my voice after we finished our swim! 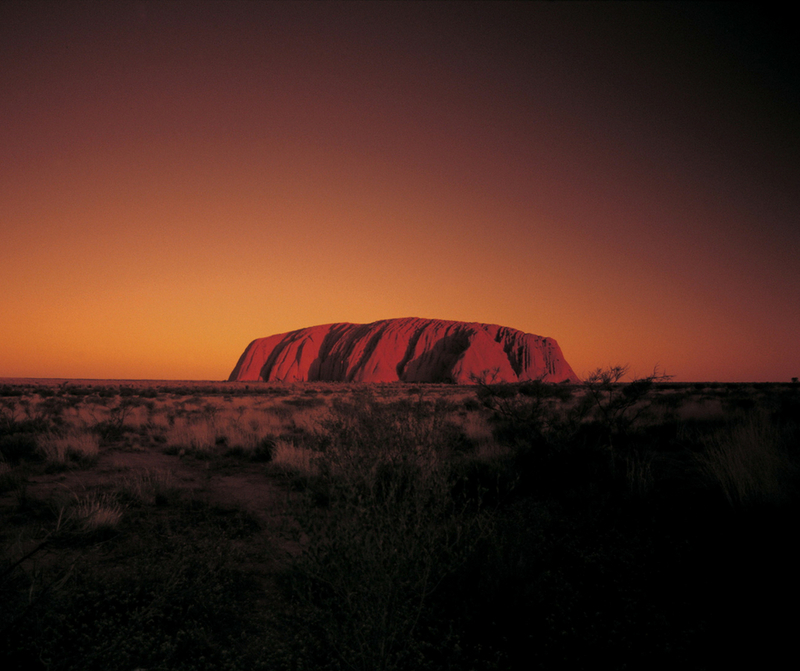 Visiting Uluru (Ayers Rock) on a camping tour is a definite must-do item for your Australian bucket list. We took a three-day tour with The Rock Tour who I’d highly recommend. After meeting our group, we visited the Aboriginal cultural centre onsite to learn more about this fascinating place. We then took a walk around the base of Uluru and stopped along the way to hear stories from the experienced guides and check out the Aboriginal cave paintings. After that, we all pitched in to cook a barbeque dinner which we ate while watching the sunset over Uluru. That night we camped under the stars in swags (a mattress/sleeping bag combo). The next morning we were up to watch the sunrise over Uluru. We had so much time at the site that we were able to see Uluru in various shades of red, something we wouldn’t have been able to do on a whistlestop tour. The tour continued on to the Olgas and Kings Canyon before ending in Alice Springs. Even after travelling to 40+ countries, my time in Uluru is definitely one of the top travel 5 experiences of my life. Tip: The flies can be overwhelming in summer, so bring a wide-brimmed hat and an insect hat-net – you won’t regret it. 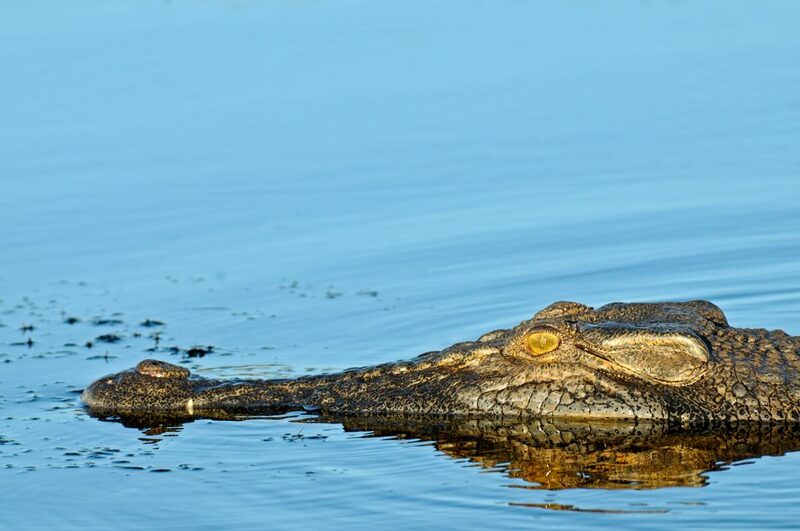 Sprawling over 20,000 square kilometres (roughly the size of Slovenia), Kakadu National Park in the Northern Territory is the quintessential Australian wilderness – the land of Crocodile Dundee. My favourite part of Kakadu is the Yellow Water billabong, which can be explored on a boat cruise. This is the place to see the giant saltwater crocodiles, brilliantly-colored kingfishers, Jabiru stalks and comb-crested Jacanas (aka Jesus birds), known for their ability to walk on water. The billabong gets flooded during the rainy season (January to April) and if you visit before the water recedes, your journey will begin with a cruise through the forest. In a boat! Another interesting place to visit in Kakadu is Ubirr. Apart from the dramatic rock outcrops, Ubirr is famous for Aboriginal rock paintings, the oldest of which date back 40,000 years. If you visit the park before May, when the dry season officially begins, you will need a high clearance 4WD to navigate the partially flooded roads. While some roads can be closed all together. I found April to be the perfect time for a visit – the Yellow Water Billabong is still flooded and the road to Ubirr is already open. The conditions will vary from year to year of course. 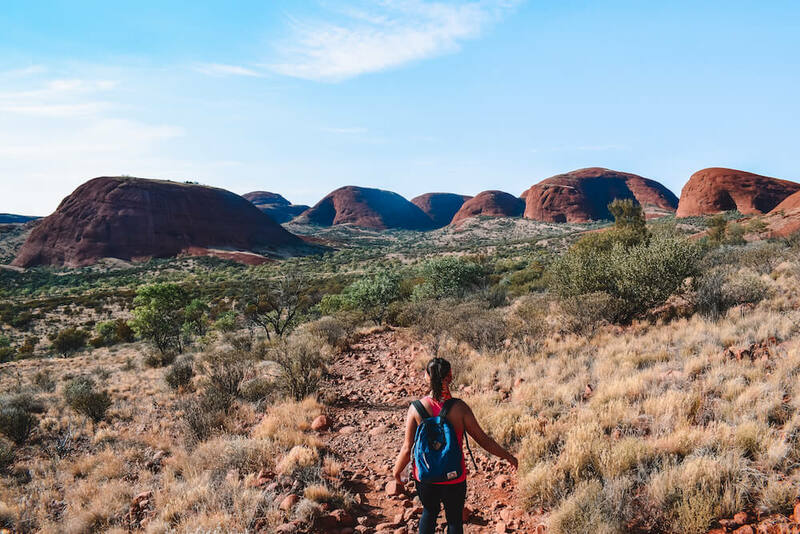 If you’re looking for the most awesome things to do in Australia, hiking in Kata Tjuta has to feature on your bucket list. Kata Tjuta is a a group of large dome rock formations in Australia’s Northern Territory, close to the famous Uluru. Kata Tjuta is often overlooked in favour of it’s more famous neighbour, but the landscapes and hiking opportunities are second to none. On my recent trip to Australia I did a 3-day tour of Uluru, which included a whole morning hiking in the “Valley of the Winds” in Kata Tjuta. There are three hiking routes with varying levels of difficulty. If you can handle a 7km walk (approximately 3 / 4 hours) I highly recommend doing the longer full circuit, as it offers stunning views over the surrounding outback that the shorter hikes don’t. You will also hike between the domes and canyons of Kata Tjuta which is an incredible experience, very different from any hike I had previously done. Don’t make the mistake of ignoring Kata Tjuta and make sure to add it to your Australia bucket list! I was fortunate to cross the Simpson Desert with my family and a small convoy of 4WD vehicles in 1999. To say the least, it was a life-changing experience. My 13-year-old self was overwhelmed with awe of the beauty, power, and silence that permeates this desert and this experience has stayed with me even now. I would absolutely recommend this journey to anyone seeking real adventure and soul searching travel. The Simpson Desert is located in the southeast corner of Australia’s Northern Territory (it also extends into other States) and is the largest sand dune desert in the world with around 1,000 consecutive, parallel dunes. The sand is a reddish colour and is dominated by spinifex bushes. This turns into a landscape photographers dream of, both at sunrise and sunset. But for me, the thing that really makes it magical beyond words is the brightness of the night sky. The stars are countless in number and so vivid that you don’t even need a light to see at night! With a simple pair of binoculars, you can glimpse amazing galaxies and clusters where ever you look. Additionally, this trip is the ultimate escape from city life because it’s many days drive from any civilisation and requires you to bring all your food, water, and fuel. 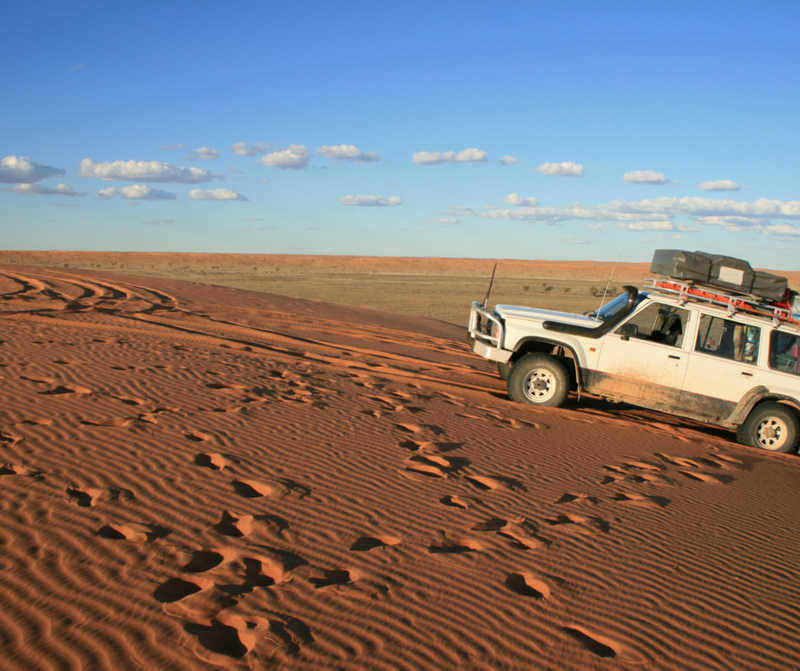 If you do decide to add this incredible adventure to your bucket list, make sure you do plenty of research and go with experienced outback drivers. Enjoy! Western Australia is the largest State in Australia, covering the entire Western third of the country. Most of the population is centred around the temperate South West part of the State, and where you will find the capital city Perth. 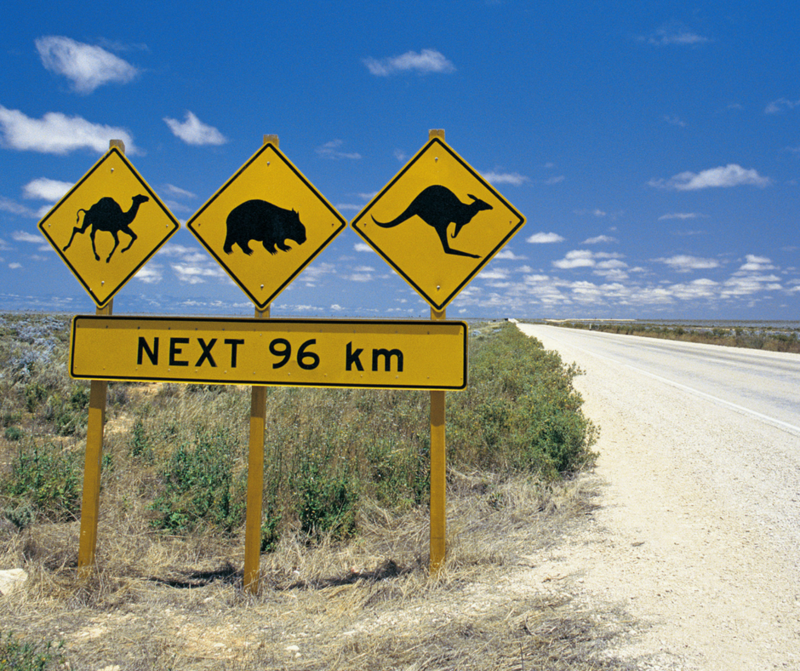 The majority of Western Australia is remote and careful planning is needed when taking on a driving holiday. Western Australia is known for it’s beautiful beaches frequented by kangaroos, the gorgeous Margaret river wine region and further North Pearl farming in crystal blue waters. On a map, Fremantle may just be part of Perth city, but the port town at the mouth of the Swan River has its own spirit and pulsing heart. Freo as we like to call it is one of the best preserved 19th-century port towns in the world with a strong maritime feel still running through the whole town. It’s a great mixture of old and new, funky new cafes, heritage listed colonial buildings, art galleries, old-style pubs and it’s working port. While the tourist attractions, including a visit to the UNESCO heritage-listed Fremantle Prison, fishing boat harbour and the Roundhouse are all worthwhile things to do, the best way to experience Freo is to venture away from the popular cappuccino strip on Market Street and explore the back streets, where you’ll find the hipster cafes, cool pubs and small boutiques. On a hot day, hit South Beach for a swim in the crystal-clear waters, relax under the pine trees and take the short stroll to the café strip up the road in South Fremantle. Where else can you enjoy the best of Australian surf, turf, grapes and hops all in one location? The Margaret River Region of southern Western Australia really is the place to come for a little touch of everything that is wonderful about our country. Ice creameries to bakeries, cheese factories to berry farms, this is THE place for trying fresh produce straight from the farm. Those with a sweet tooth are not forgotten either. The Margaret River Chocolate Company is one of the best you’ll find in the west whilst Candy Cow in Cowaramup is unmissable if you have little ones in tow. Nature lovers will be excited by the natural limestone caves to explore in the region, along with ample places to fish, bushwalk and camp. Finish your stop in the region with an unforgettable a stroll up the longest wooden jetty in the southern hemisphere. Our best tip for visiting Margaret River is to give yourself plenty of time. It might not look like a huge part of Australia on a map, but there are honestly stops you will want to make every few kilometres! Map some ideas out, find somewhere central to base yourself then pace your visit to enjoy and appreciate the region to its fullest. To say that I was swept away by Broome, the most north-westerly town in Western Australia, is an understatement. It could be described as the last outpost before hitting the vastness of The Kimberley region. But more than that it is a thriving beach resort town that is famed for one of the world’s best beaches – Cable Beach. But more than this there is history dating back eons ago at Gantheaume Point where dinosaur tracks are revealed in the beach’s red rocks during low tide. The exotic pearling industry past has made the place a mix of cultures and traditions. The once bawdy saloon filled streets of Broome are now filled with pearl showrooms, retail outlets and trendy cafes. The amazing turquoise waters and the intensely coloured red earth are what draws visitors from around the world to this picturesque sleepy outback town, Broome. Whether you are a thrill seeker, adventurer, culture vulture, water lover or sun seeker there is something for everyone with some of the best attractions in Western Australia. 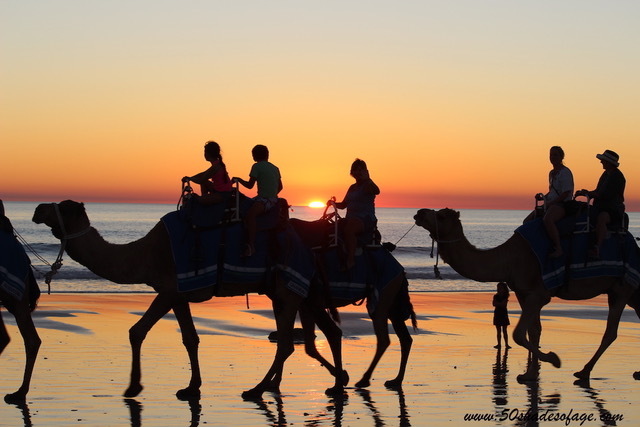 For me the highlight of Broome was drinks at sunset on Cable Beach and the slow bumpy ride on “the ships of the desert”. Camel safaris take place every afternoon along the long stretch of beach. The colours of the sunsets are exquisite as they reflect onto the Indian Ocean and also onto the white sand. I don’t think anything else in this world would compare with such beauty. My Australian bucket list item would have to be Exmouth in Western Australia for its incredible beaches. It’s the ultimate place to enjoy dazzling white sand and clear, shallow turquoise lagoons without any crowds. Turquoise Bay is my personal favourite (although you have plenty of other idyllic beaches to choose from in the area). 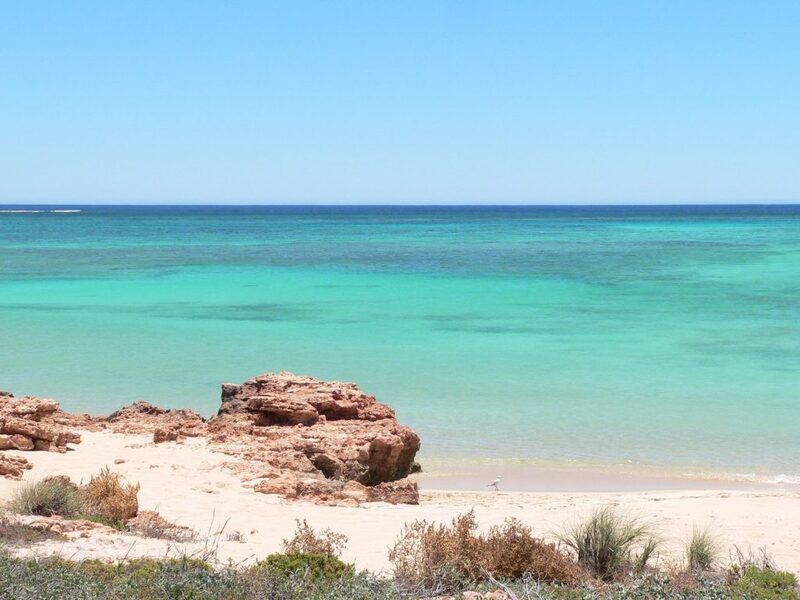 Located within the Cape Range National Park, Turquoise Bay is known as one of the best beaches in the world. You can snorkel right off the beach and do the famous ‘drift snorkel’ here. The current moves you gently in the water as you effortlessly float over the coral, past turtles and reef sharks. 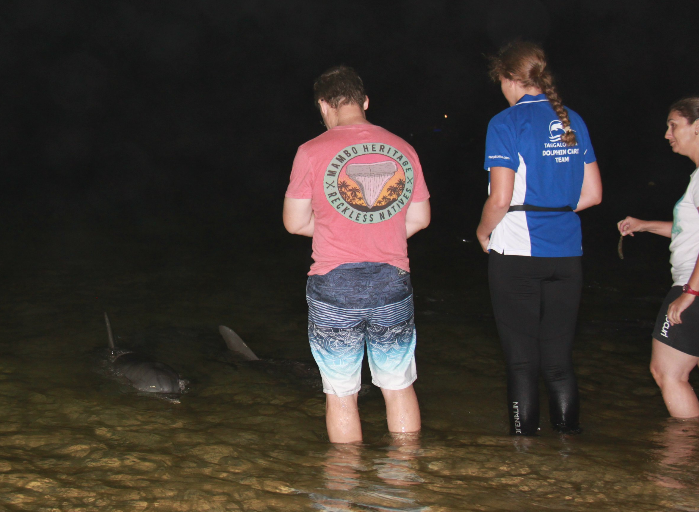 If you love wildlife, time your visit to Exmouth to co-incide with the arrival of the whale sharks from the end of March until the end of July, or see the turtles nesting or hatching. Turtle nesting season runs between December and March, and hatching season is in February and March. A quick 25 minute dash across the water from Fremantle Bay is the beautiful Rottnest Island. Rottnest offers up a wide variety considering its relatively small size. There’s an abundance of beautiful pale sand beaches along gorgeous sweeping bays and plenty of walking and biking routes to explore. Rottnest is also a popular place to camp, and there are a number of holiday cottages available to rent for those looking to make the most of the island’s seclusion. There are also very good cafes and restaurants for a spot of lunch. 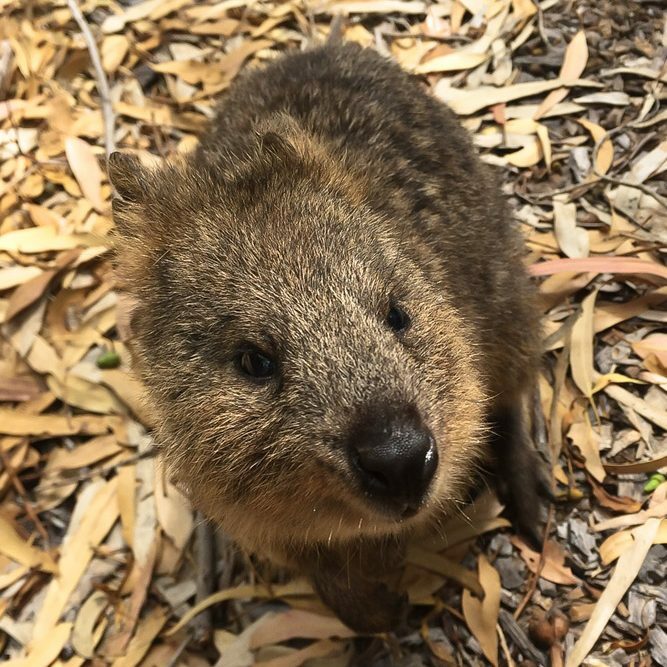 Arguably the greatest reason to visit Rottnest is the chance to get up close and personal with the super cute quokkas that the island is named after. 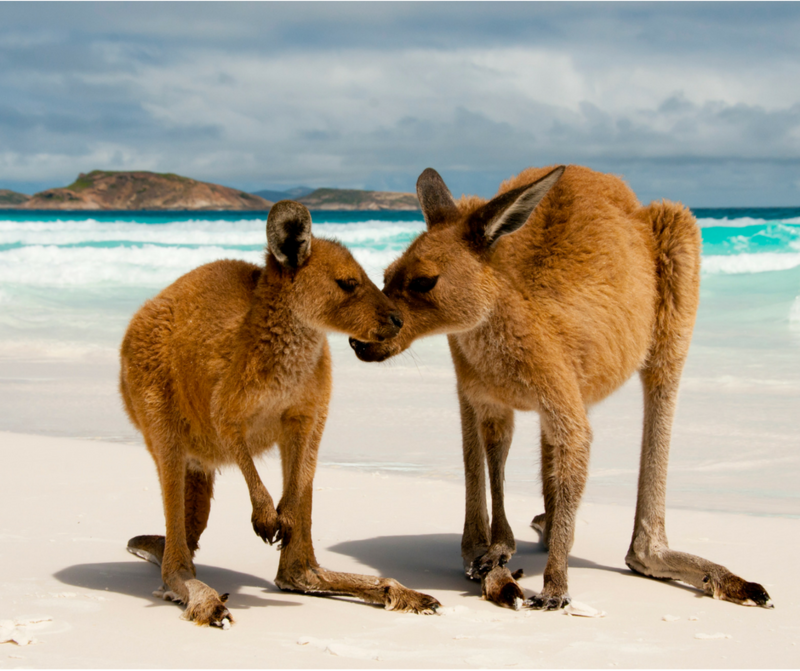 There are over 10,000 quokkas on Rottnest Island, and the friendly, furry marsupials are a major draw to the island. When the Dutch landed on the island in the 18th century they were so perplexed by the quokkas that they named it Rat’s Nest Island. The name has stuck despite its inaccuracy and today the quokkas are a tourist attraction in their own right. Rottnest is very popular on weekends and can get very busy, so if you have the chance visit during the week when it’s likely to be a lot more peaceful. If there are two things that epitomise Australia, it’s kangaroos and beaches. At Lucky Bay, in Cape le Grand National Park on the south coast, you can get the chance to combine the both in one stop. It’s around an hour’s drive from Esperance, and is the postcard-perfect Australian beach: white sand that squeaks when you walk on it, clear water turning to turquoise in the distance. However, by far the best thing is the kangaroos that spend their days hopping by, nosing around in the bushes or sometimes just laying down on the sand mimicking the sunbathing humans around them. They’re very tame – having been exposed to curious humans for several generations – and will wander around happily enough, posing for pictures. Just next to Lucky Bay is a very popular campsite where you can stay the night – though make sure you get in early, as in peak season it can be completely full by 10am. However, there is also another campsite in the national park, which tends to be quieter but also has a beautiful beach just metres away from the campground. 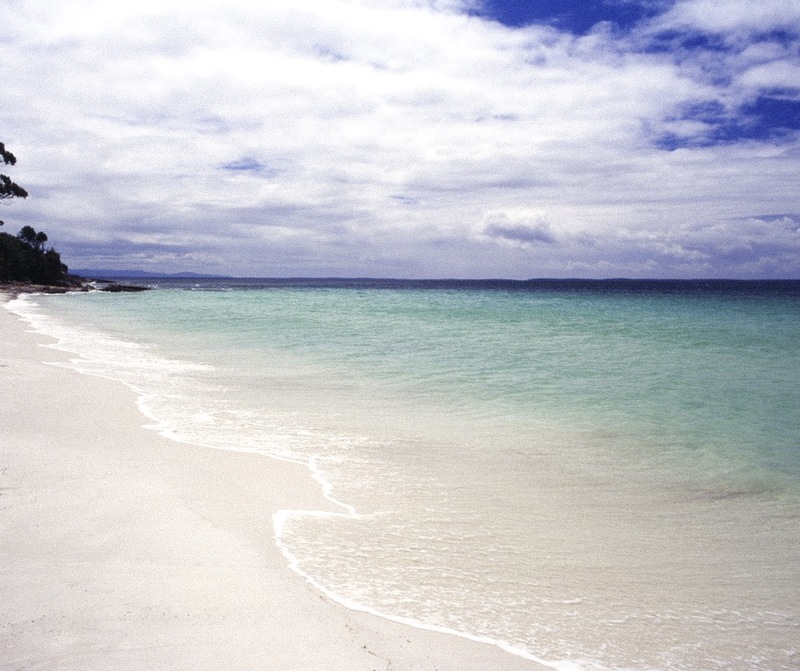 South of Margaret River, almost at Augusta in Western Australia is a very special beach: Hamelin Bay. 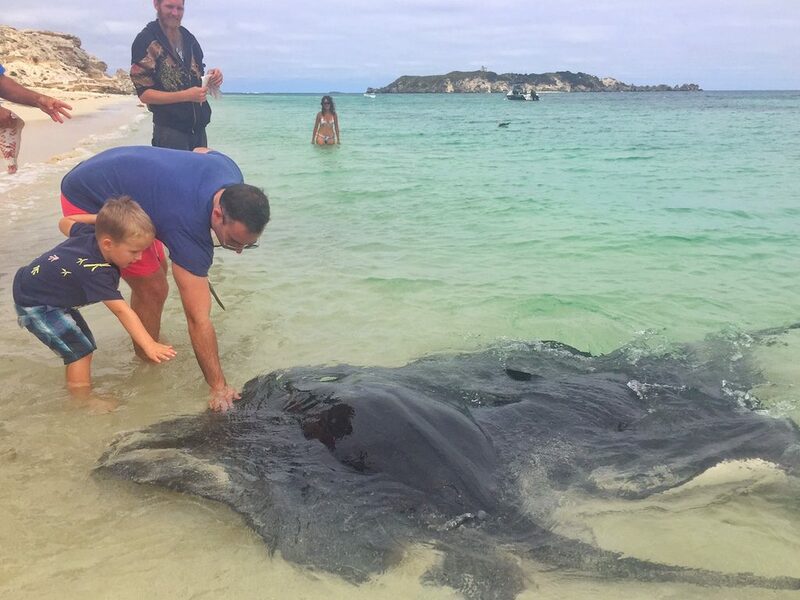 Not only is Hamelin Bay a stunningly beautiful beach with soft white sand and crystal clear water – it also offers something very special that you will rarely find at any other beach in the world – stingrays! Big, beautiful sting rays that come right into the beach and swim around your feet. When you arrive at Hamelin Bay, make your way to the boat ramp where the fishing boats come in and you will see several sting rays and eagle rays, all hoping to score some fish scraps off the fishing boats. Stand in ankle deep water and shake your fingers on the surface of the water and the rays will swim up to you in search of food and tickle your feet. An amazing experience. Want to swim in secluded pools surrounded by canyons made of some of the oldest rocks in the world? 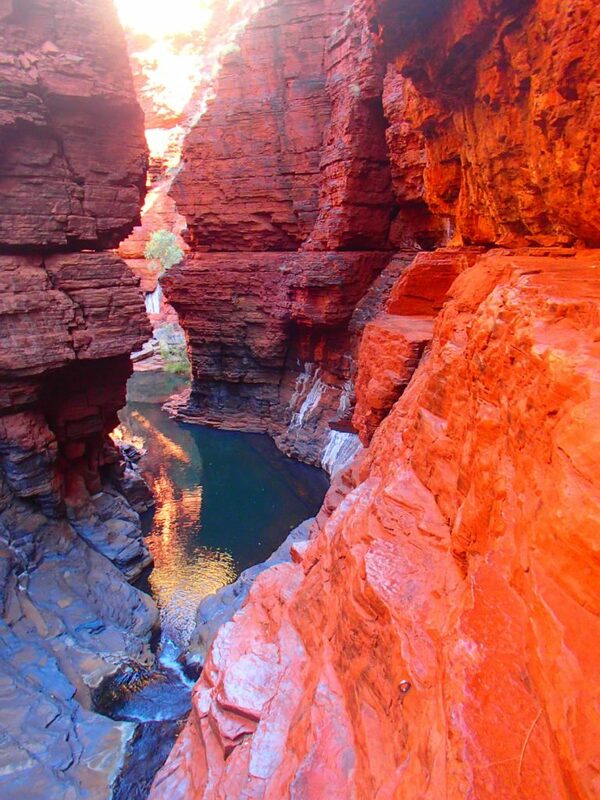 Head to Karijini National Park! Pronounced ‘care-uh-GEE-knee’, this spot is definitely “out the back of Bourke” (as Aussies say). You’ll need a car that you’ve driven 1,400km from Perth or that you’ve rented after flying into Newman, Port Headland, or Karratha. Spend the day chauffeuring yourself between stunning swimming spots and admiring the hundreds of hues on the canyon walls. Picnic next to epic termite formations (Don’t worry it’s safe!). Go on a canyoneering tour. Or if you’re interested in plants, flowers, geology, or the area’s history, make the excellent visitor’s centre a top priority. Consider popping (a cool 600km’s) over to the coast and experiencing Ningaloo – the world’s largest fringing reef – while you’re in the area! South Australia can be described as the state of extremes. From city life in the capital of Adelaide and it’s stunning surrounding beaches, to driving the great expanse and remoteness of the Nullarbor Plain. There is so much to see and do in South Australia, from visiting award winning wine regions, National Parks full of wild kangaroos, Oyster farming in Coffin Bay, remote outback towns leading to the Simpson Desert. Temperatures can also be extreme with long hot summers and cool winters. 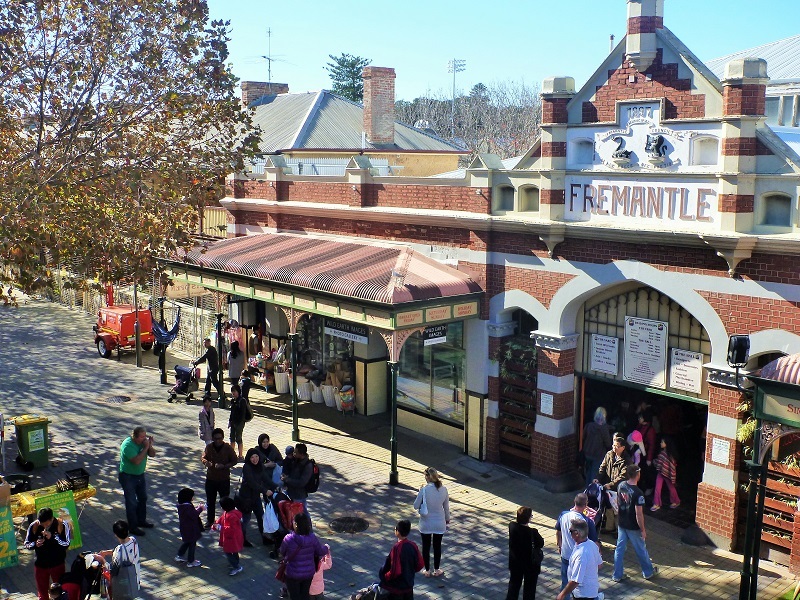 ‘rAdelaide’ (as the locals call it) may just surprise you! Adelaide may not be the first place you think of when you travel to Australia, but it’s one place you should definitely visit! There are lots of things to do in the city, and it’s not the rural backwater it’s sometimes made out to be. The museums and art galleries are well worth a visit, as is the Botanic Gardens, which is arguably the best of any in the country! It’s a great place to relax, especially on a warm day! You can also head to Rundle Mall if you fancy some shopping, and Chinatown should you wish to get some cheap and delicious food. One of the best things about Adelaide is that it’s close to some fantastic beaches. Glenelg and Henley are not far. from the centre, and both offer excellent beaches that are an ideal place to visit when it’s sunny. You can cycle to both in under 45 mins, and the routes take you through some beautiful suburbs in Adelaide. If you want to see a different side to Australia and visit an unheralded part of the country, Adelaide is the place to go! 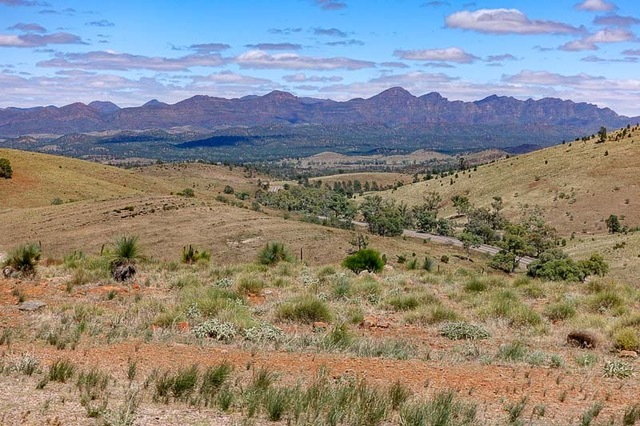 The Flinders Ranges in South Australia are one of the easiest areas to access that shows off some of the Australian Outback. It’s only a four hour drive from Adelaide, all on good, sealed roads. Once here, explore the ancient red hills covered with undisturbed bushland. You will be sure to see kangaroos, emus and many other native animals in their natural environment. If you are feeling especially adventurous, you can also eat many of those local animals for lunch at the Prairie Hotel, Parachilna, which is renowned for it’s “Flinders Feral Food”. Hike in Wilpena Pound, or spend a day with a member of the local Aboriginal tribe, learning traditional ways and visiting cave rock art thousands of years old. Taking a scenic flight will show you from the air exactly how vast and beautiful this country is. Tip: If you are visiting between November and February stick only to the main tourist places. Temperatures are often into the forties (Celsius) during summer, and the area is very remote. Phone reception can be patchy, so if something goes wrong, it can go very wrong! You will also find – like I did during my late February visit – that some things are closed during this time too. Why would a long stretch of road in the middle of nowhere be listed as a “must see”? Many people mistakenly believe that the Nullarbor Plain is something that must be endured – a long boring drive along the Eyre Highway as you head from the east coast of Australia to the west (or vice versa). 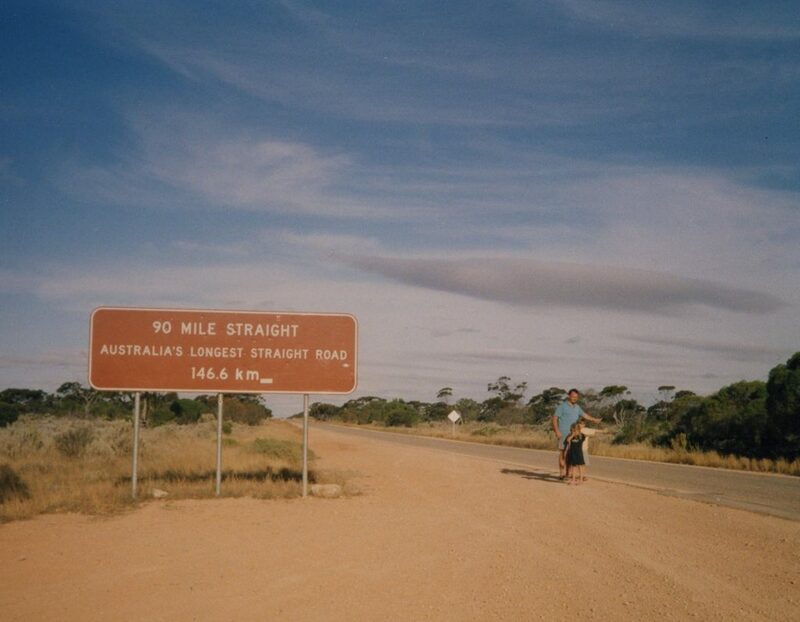 And while it’s true that the Nullarbor crossing does include Australia’s longest straight road, the 90 Mile Stretch (146.6km), this is a trip that shouldn’t be hurried. Taking the time to savour the journey is an essential part of the Nullarbor experience. Who among us hasn’t wanted to “get away from it all”? While fuel, water, food and accommodation are available every couple of hundred kilometres, you can pull up almost anywhere and camp along the way, which is the best way to enjoy the solitude and the sights. Yes, the sights! This barren desert stretch is home to the sandy ruins of the old telegraph station at Eucla; the eerie Cocklebiddy Cave; the majestic Bunda Cliffs, the Great Australian Bight and the Southern Ocean. Visitors in August and September may even be lucky enough to spot the migration of the Southern Right Whales. The State of Tasmania is isolated from the mainland, located south of Victoria. Tasmania is a nature wonderland, with it’s wilderness accounting for one-fifth of the landscape. With rugged coastlines, Mountainous National Parks and pristine beaches, Tasmania is the ideal place to get back to nature. The climate is cool, making the region perfect for whiskey and gin distilleries, wineries and some incredible farm fresh produce. Visiting Hobart is like taking a step back to another time, a time when Australia was a penal colony. 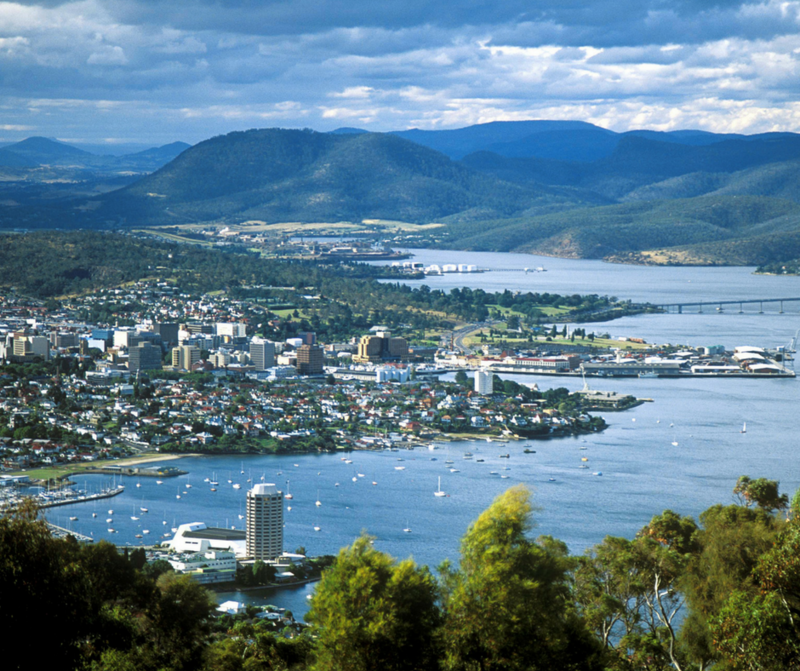 In fact Hobart is Australia’s second oldest city after Sydney, having been founded in 1804. Built around the harbour of Sullivan’s cove, you will find that many of the original buildings lining the harbour are still standing from that era. If you admire old architecture and a feel of an old world charm or have an interest in convict history, then Hobart is a fabulous place to explore. 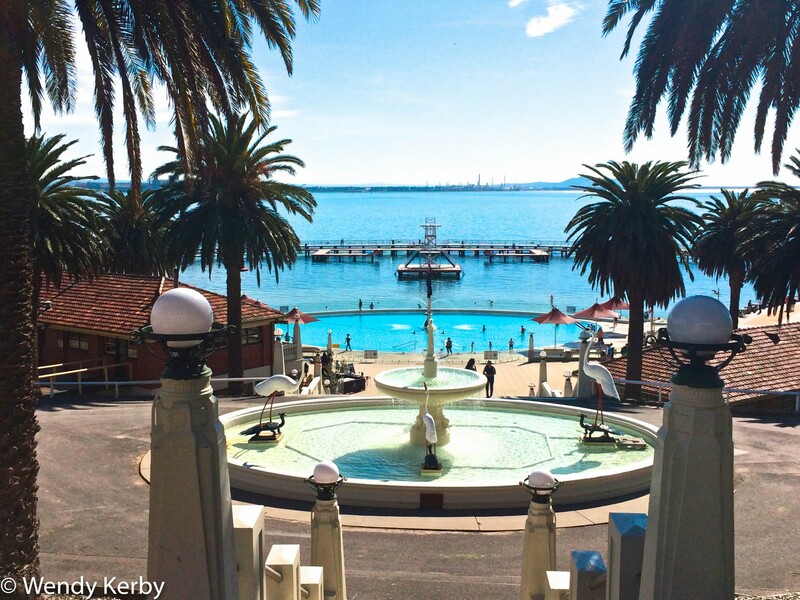 For more on What to see and do in Hobart click the link. 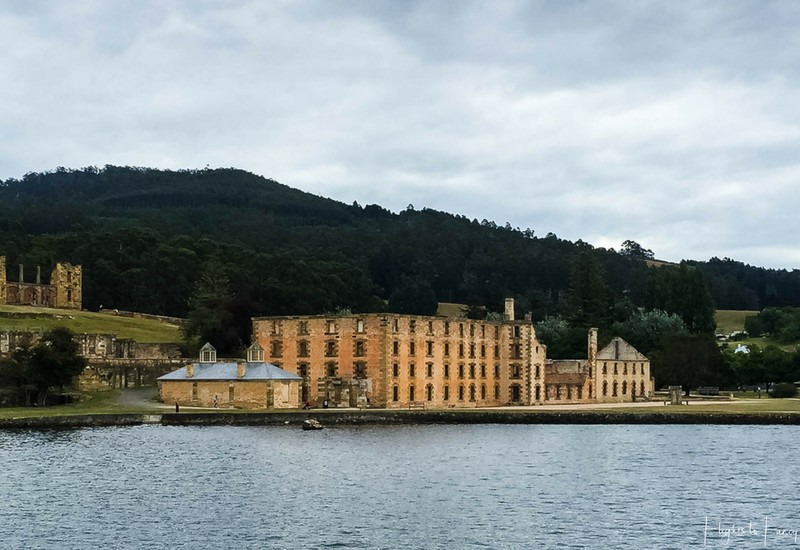 Just over an hour from Hobart, Port Arthur Historic Site offers day trippers a soul-shuddering glimpse into Australia’s dark history. The British arrived on Australian shores in 1788 and set about decimating the indigenous population while subjecting their own to a life of misery in shackles. The then inhospitable island of Tasmania was the ideal place for a convict punishment centre due to its isolation. Port Arthur opened in 1833 and tortured those found guilty of the most heinous crimes for 44 years until the doors closed in 1877. The tales of human suffering, including of children as young as 9, will jolt your consciousness as you compare life at Port Arthur to your own comfortable existence. A visit to Port Arthur is a sobering experience and the events of the past should serve as a stark reminder to us all to do better; today and every day. My Australian highlight has to be finally making it to one of the places that first inspired me to travel, Wineglass Bay. I had seen it countless times in travel inspiration stories and bucket list books, I knew I had to include Tasmania in my trip. 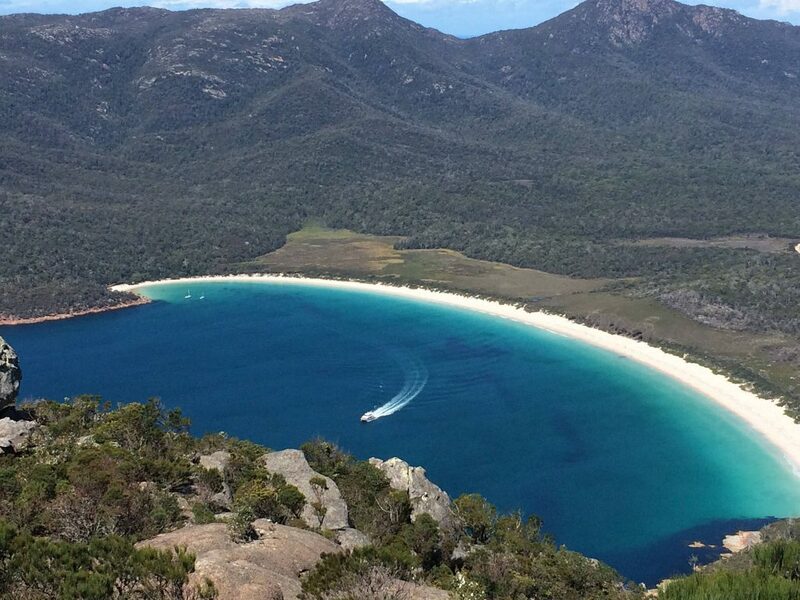 Wineglass Bay can be found in Freycinet National Park, a small peninsula jutting out of the east coast of the Australian island famed for its devilish inhabitants. The iconic lookout point, where most of the photos are taken from, is about a one hour hike from the wallaby infested car park. A rocky, but easy going path guides you there, you don’t have to worry about getting lost. If you continue on up past the first point, you can get higher for even more spectacular views, I decided to head down to the beach itself. This turned out to be a great decision. Many of these iconic beaches disappoint once you actually set foot on them, but not here. As I emerged from the wooded path down, I was surprised at how peaceful it was. It seems that not many tourists make it down to the actual beach, happy with their photo from up top. I easily found a spot just for myself to kick back and relax in the soft sand enjoying the sights of the perfectly curved beach with a wonderful green forest backdrop and the sound of large rolling waves wondering if I could bring myself to leave. The Australian Capital Territory (ACT) as you will guess is home to Australia’s capital city, Canberra. A planned city, the design of Canberra was the brain child of architect Walter Burley Griffen. Having won a design competition in 1912, with his scribbled entry on a piece of cloth and so the conception of Canberra began. Canberra is nicknamed the ‘bush’ capital as it is surrounded by National Parks, nature reserves and sits on Lake Burley Griffen. Canberra is home to Australia’s Parliament, which you can visit and view a lively question time, the Australian War Memorial and a number of festivals, including the Floriade festival. Canberra was ranked #3 in the Lonely Planet’s Best in Travel 2018. 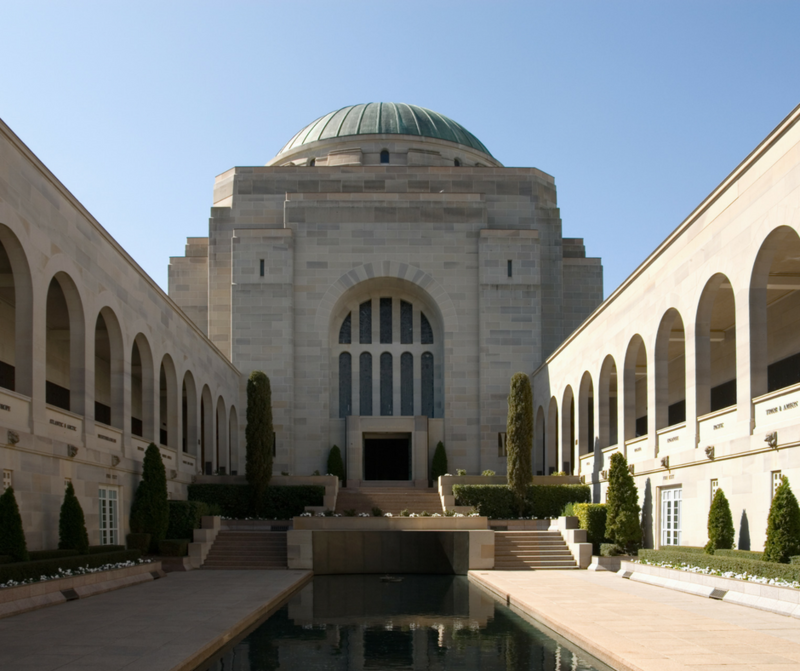 The Australian War Memorial offers an amazing collection of war history and serves as a memorial to those who have given the ultimate sacrifice. It serves not to glorify war, but it gives the visitor a moving journey through history. The displays offer highly informative content and the design is outstanding, showing Australia’s participation and contribution to world peace. The grounds itself are extensive and you will need a good few hours to wander about, taking it all in. No to be missed is the Last Post Ceremony that occurs everyday. Each service begins with the reading of the ode and the laying of wreaths and floral tributes at the base of the pool of reflection. Each ceremony recounts a story of a fallen soldier, the circumstances they came to enlist and serve their country. It gives a personal story to those who are being paid tribute to and remembered. The ceremony concludes with the playing of the last post (guaranteed to leave you emotional). The service occurs every day at 4.55pm and is free. Public transport: Trains and buses in main cities are very good and extensive. Getting to country areas will have less regular services and isolated areas may be best explored with a car. Car hire: If you are a temporary visitor to Australia you can use your overseas drivers license to rent a vehicle in Australia. Of course there may be certain conditions that may vary from state to state. Ensure that your details on your license are in English and up to date. If your license does not have a photo, ensure you have other photo ID to support your license. Flights: There are regular flights to each capital city, along with some regional airports. The main domestic air carriers are Jetstar, TigerAir and Virgin Airlines. Tours: Joining a tour will also help you get around to areas of Australia that is remote or lacks regular public transport. What does a flight to Australia cost? Like it? Why not Pin it!